After six weeks of figure drawing in a very crowded studio, my University of Washington Drama grads were finally able to spread out a bit. 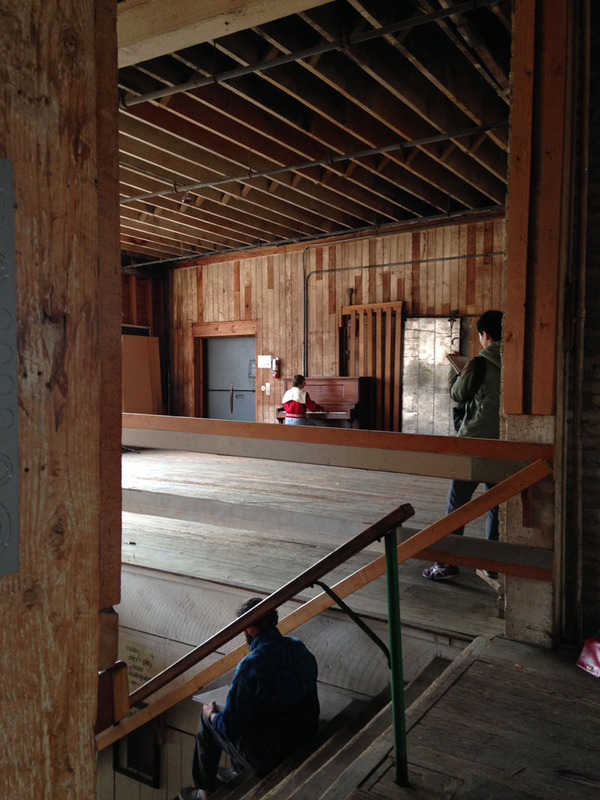 We were lucky enough to score a field trip to the Millworks building in Seattle’s SODO Industrial district, and had the entire two-story vacant former sawmill to ourselves. 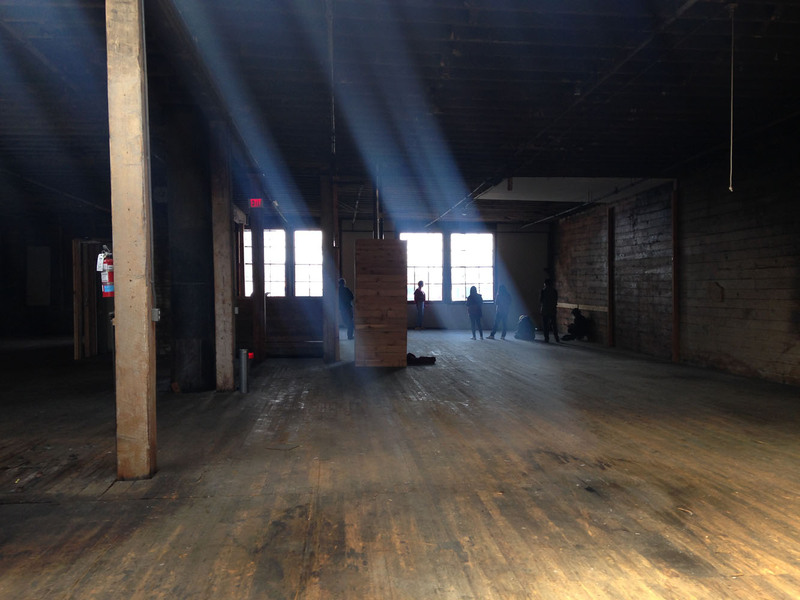 The building is mostly empty, its gorgeous beams and planks exposed, but the few items that remain are intriguing. They lent themselves to oblique narratives once model Amanda got hold of them: several potbellied stoves, wall-mounted phones, a traffic light, a piano. The last one particularly piqued our curiosity about the former occupants: Did the mill provide live music for its employees while they toiled? Or perhaps they just had really good Christmas parties, a la Mr. Fezziwig? There is certainly enough room in there to dance a reel or two. Natural light pours in from huge windows on either end of the long second floor, and from a giant skylight overhead. The whole building is one solid block of wood, the fir planks aged into different shades that create random stripes along the walls. I encouraged the students to look for oblique points of view and dramatic scale shifts when they chose their compositions. 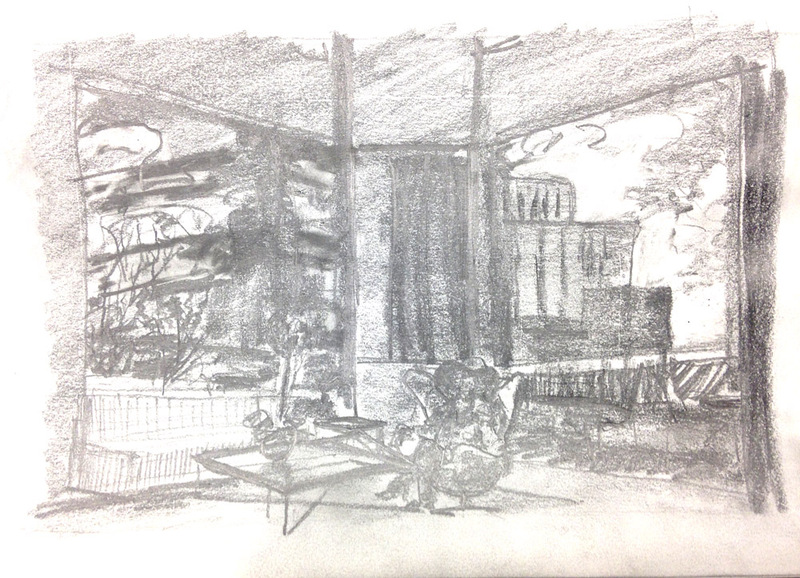 It’s not very often one gets to draw so much empty space, with no distracting trees or furniture. 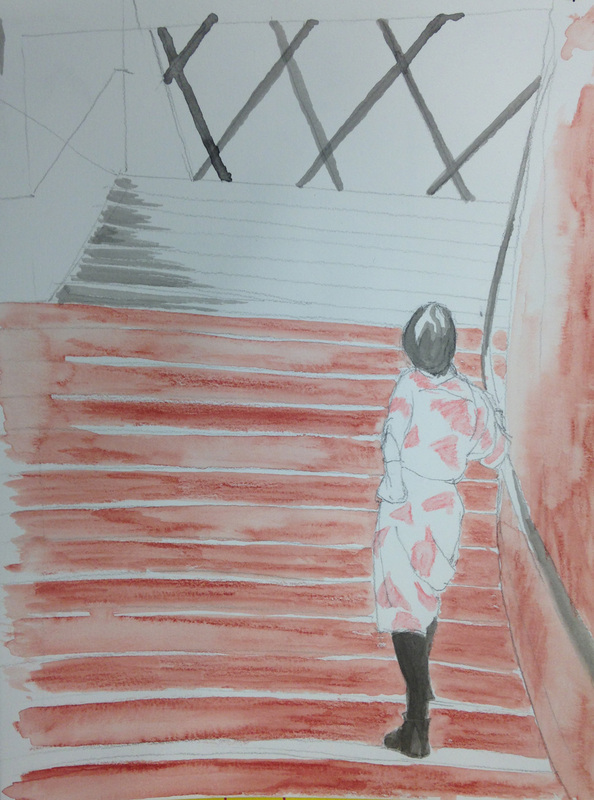 The model’s point of view from the top of the stairs. The highlight for many of these theatrical types was the creepy basement, where “low clearance” signs in a passageway were a bit of an understatement. 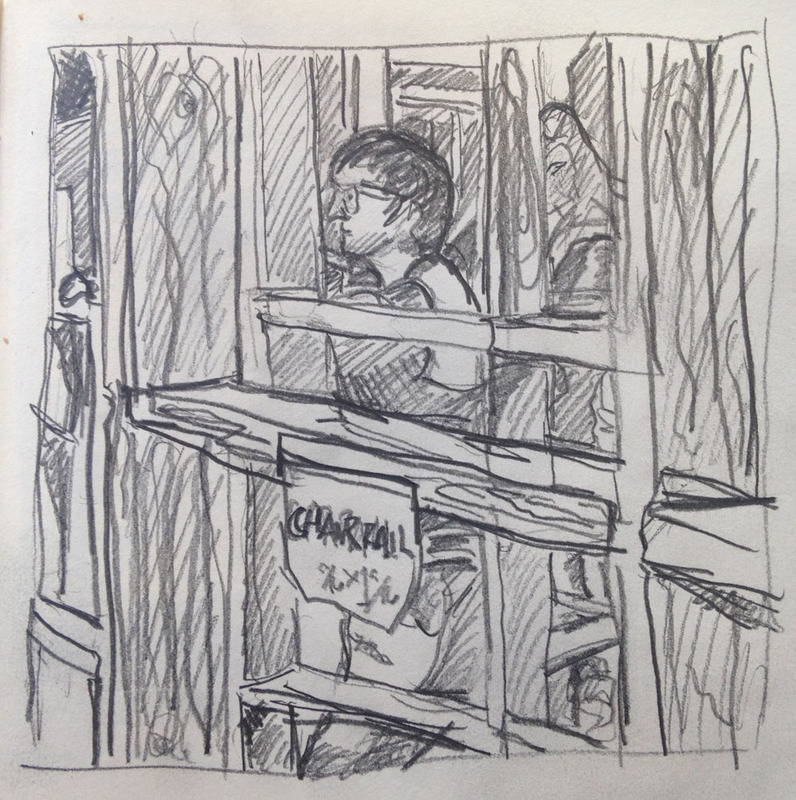 We stayed for just one drawing down there in the mustiness, in an Escheresque forest of lumber racks. Big thanks to Urban Visions for making this possible! This spring my University of Washington drama grads and I went on a whopping five field trips around town. Seattle abounds in outrageously draw-able scenery, even more so if you explore past the typical tourist sites and find those gems that are hidden in plain sight. 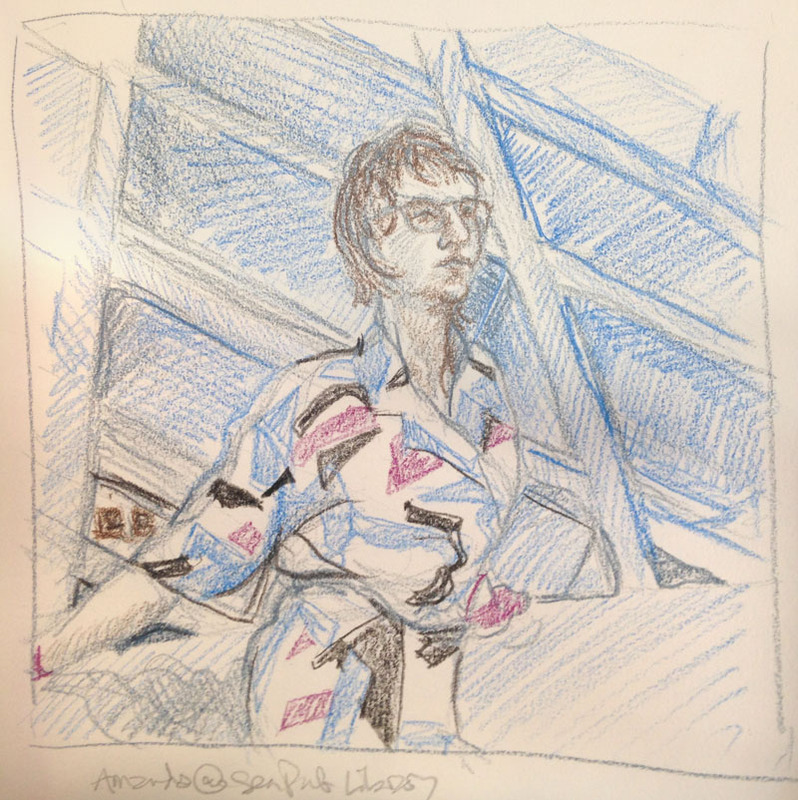 Since this is a life drawing class, we are always accompanied by one of our fantastic models, who enjoy showing up in outfits apropos of the location. 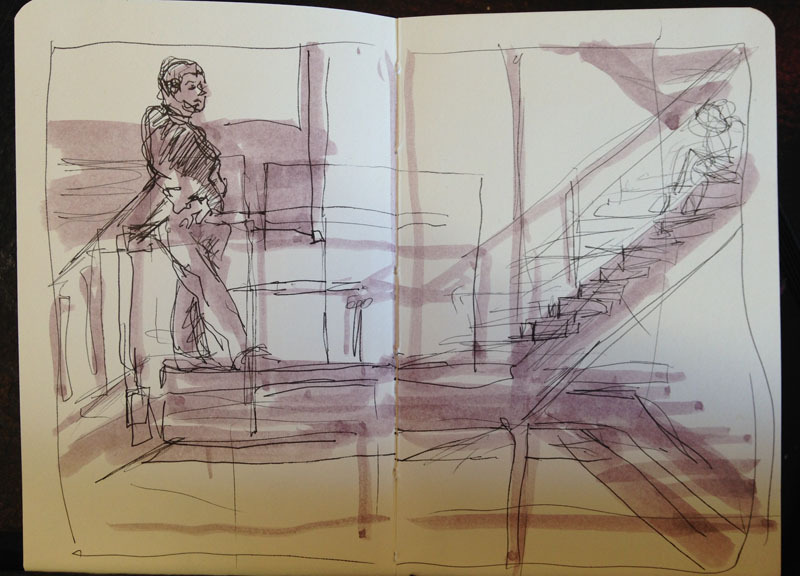 Drawing the model on location puts the life back into life drawing. 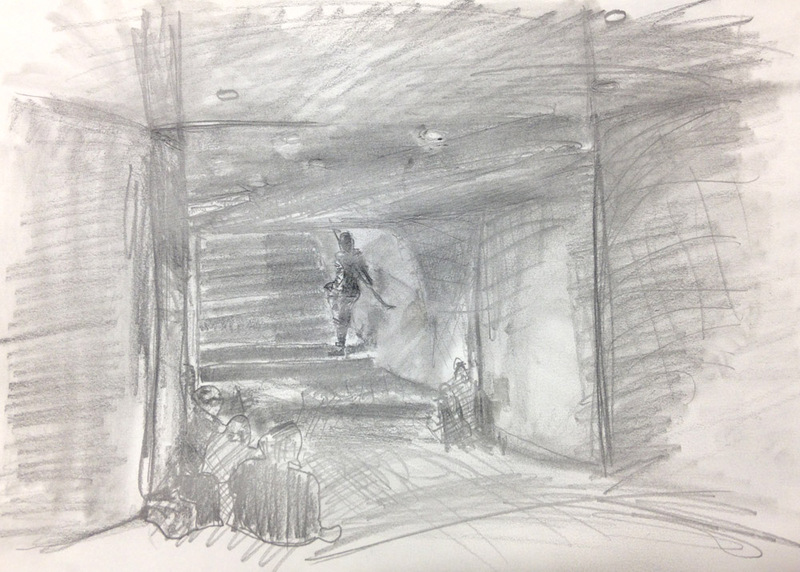 Advanced students need the additional challenge of spatial relationships, scale, and changing lighting, but beginners respond well to the change of scene, too. 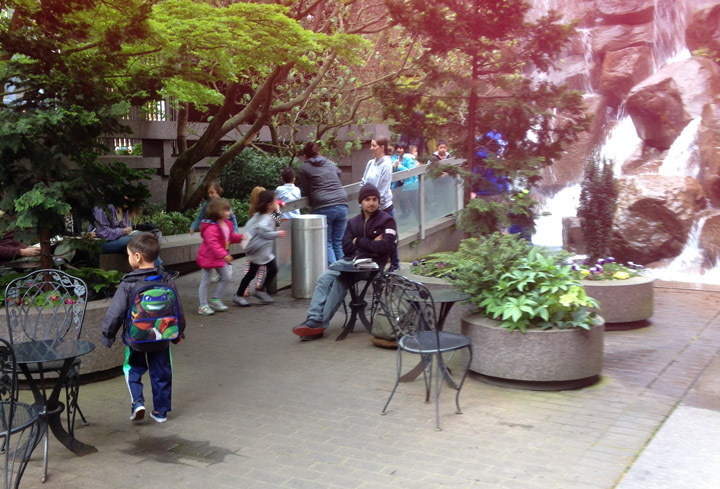 A day intended to be spent in Freeway Park was too chilly and rainy to hang around outside, so we moved indoors to the nearby Washington State Convention Center. It’s a public facility with lots of tables and chairs, very convenient for drawing, looking (to me at least) as if it were intended for that purpose. 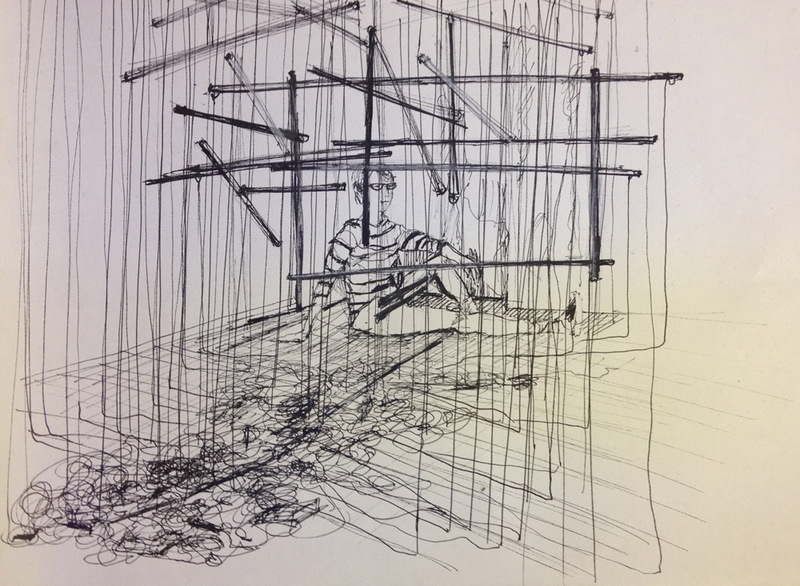 Suspended above the freeway on the third floor, surrounded by skyscrapers, the model seemed to be in an abstract environment that isn’t immediately discernible in the drawings. It’s a little disconcerting how outdoor space bumps up visually against indoor space, with unexpected vertiginous elevation changes. Kind of like an avant-garde stage set. The concrete forms (which abound in the park next door) have a sort of soviet-union feel to them, something the workers might spend their allotted leisure time picnicking on. Present-day capitalist workers enjoy a smoke beneath us. The weather was more cooperative a few weeks later for our trip to Seattle Center. Home of the iconic Space Needle, it also has lots of interesting courtyards tucked away on its mid-century futuristic grounds. The International Fountain is a favorite hangout of locals, but we got there in the morning before it was overrun by children (or even water). A much smaller fountain and wading pool is hidden around the corner, surrounded by Flintstonesque walls and dotted with big flat rocks. 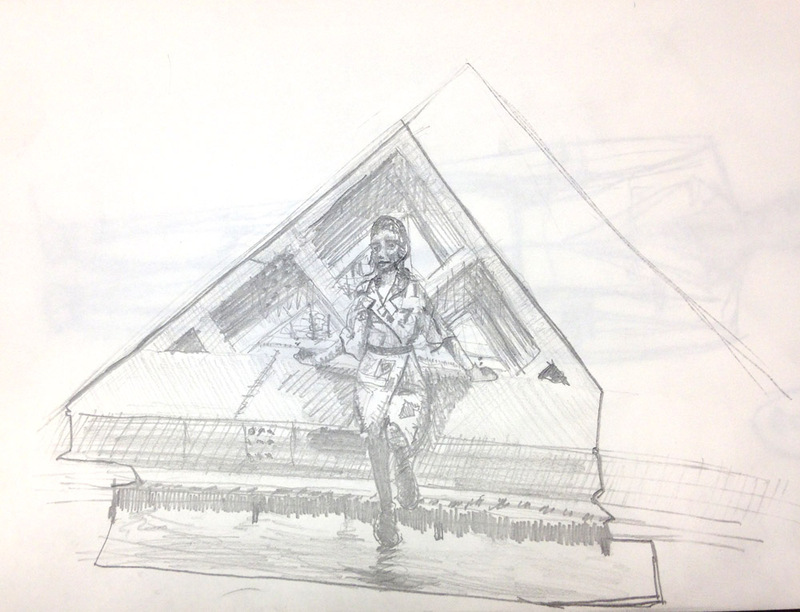 As with the other fountain, one should get there before the kids for ideal (and dry) drawing conditions. 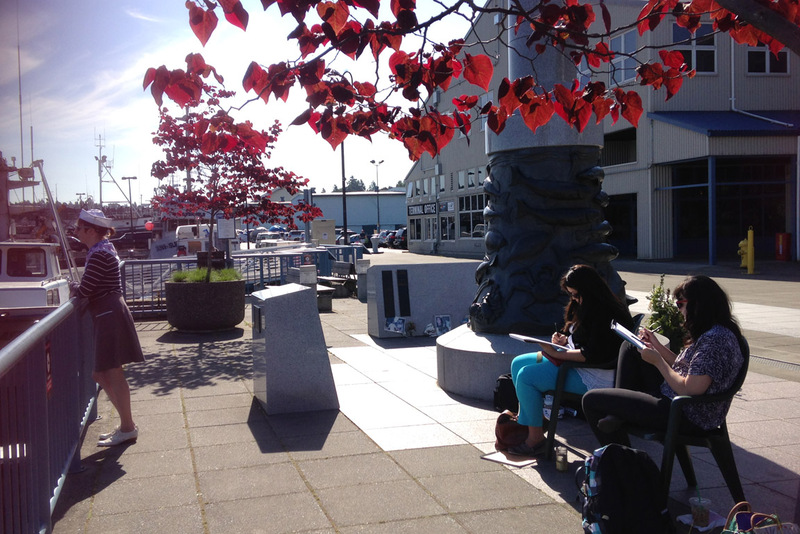 A few weeks later, we were back to shivering again, downtown at the Harbor Steps, another great public space and exercise in three-point perspective. 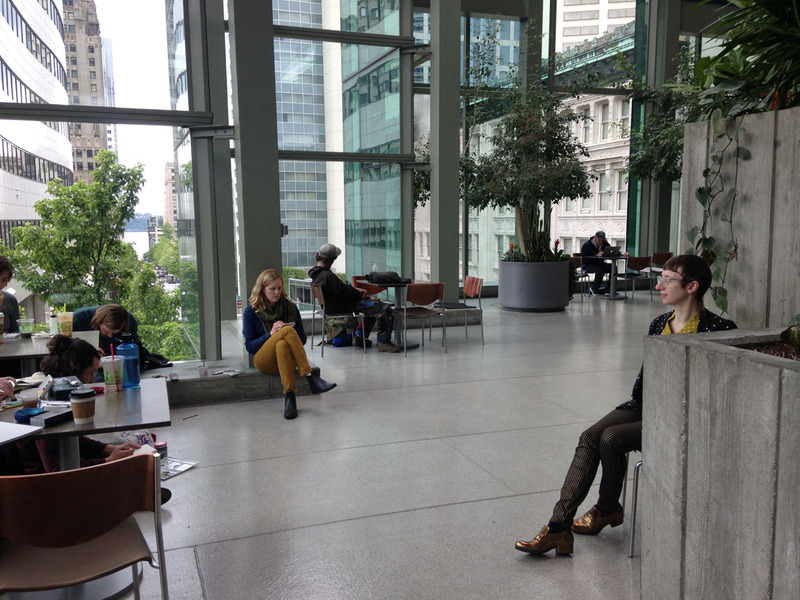 When we got too cold, we ducked into the Seattle Art Museum for warmth, where we drew, and even painted, unmolested in the lobby. But wait! What’s that bright yellow thing outside the window? The sun! Time to go back outside . 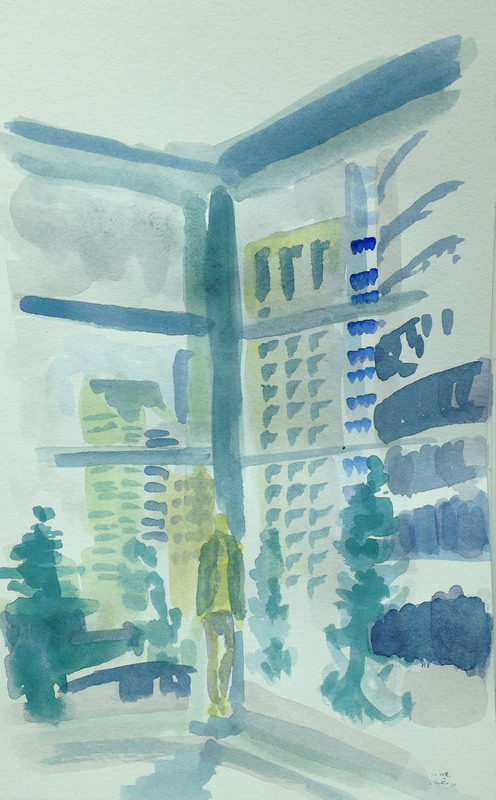 . . to a top-secret location on the scenic and underused roof of a nearby office building, where it is also apparently acceptable to draw and paint. 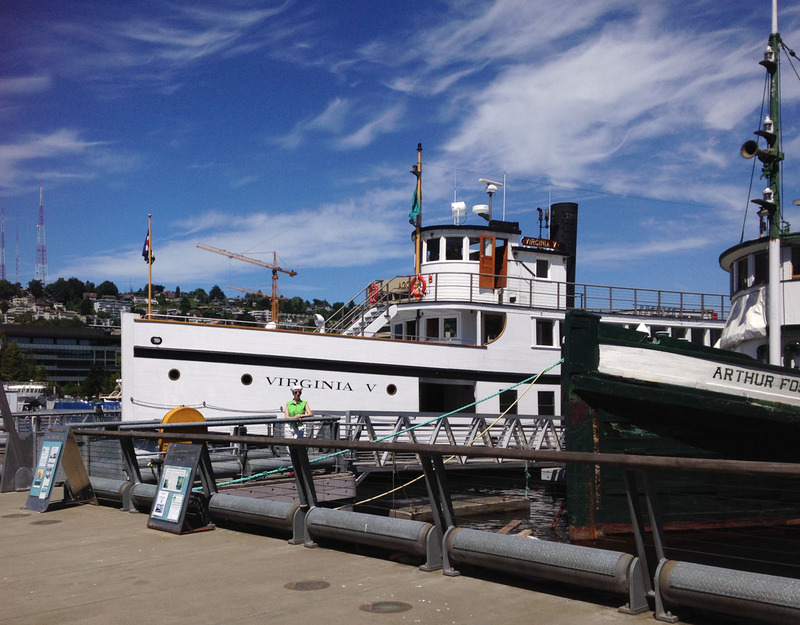 The following week it was unambiguously sunny for our final class, which was spent at the Center for Wooden Boats in South Lake Union Park. The setting is almost like a mini-landscape lesson, with the horizon line conveniently delineated along the other side of Lake Union, nearby large ships looming red in the foreground, and distant trees receding into handy bluish atmospheric perspective. Flat lawns, water reflections, even a shady side of the building for when it gets too hot. 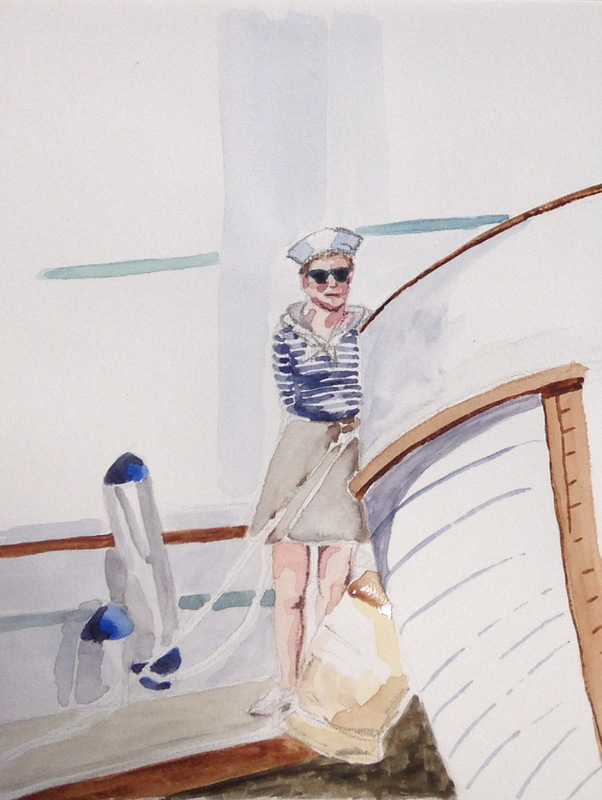 Amanda looked so authoritative in her nautical garb, some tourists asked for information while she modeled. 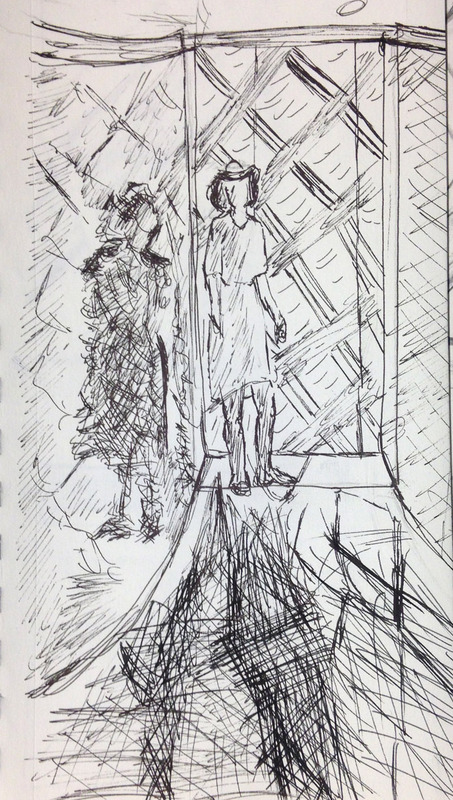 My University of Washington Drama students and I went on a little drawing excursion this month to a train station that isn’t really a train station, with stone walls that aren’t really stone. No passengers have embarked upon their adventures from Seattle’s Union Station since 1971 when the last train stopped here. This 1911 beauty had stood vacant and unloved for thirty years until a local developer restored it to its former glory. But you still can’t get on a train; you have to walk across the street to King Street Station to do that. I brought along a suitcase anyway, for our model to use as a prop. 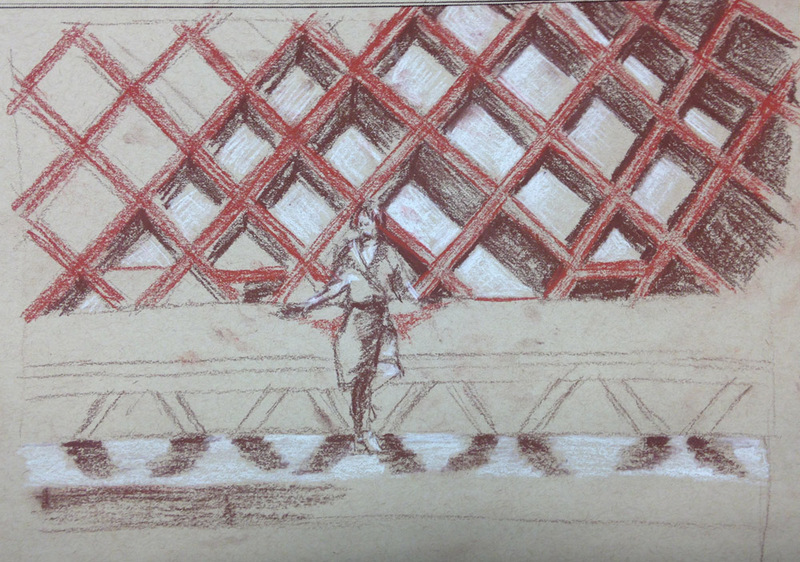 On previous drawing visits, I had struggled a bit with the color of the stone walls in the Great Hall. They were kind of creamy, kind of yellowy, not quite sandstone; and several different variations of this non-color in a random pattern of big blocks. As it turns out, I might have just consulted Sherwin-Williams for the color numbers. 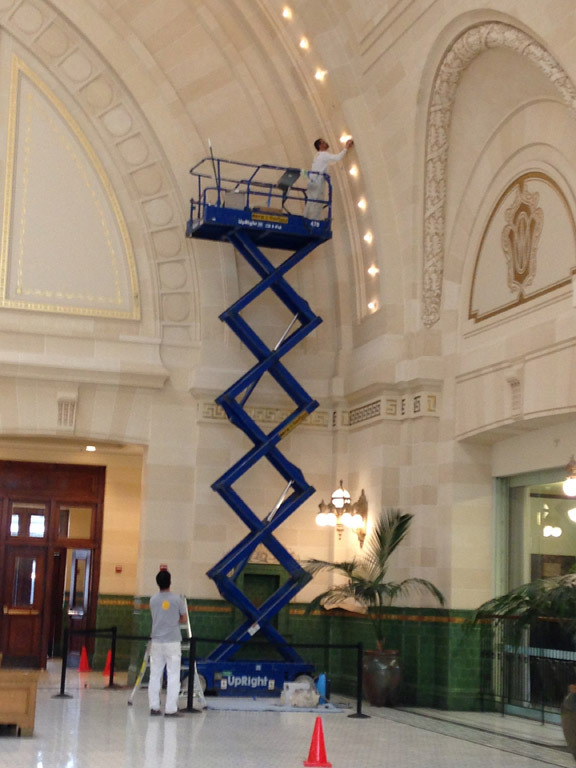 On this day, a tall scissor lift was set up in the corner, with a couple of men doing some kind of work on the walls. I assumed they were masons making repairs to the stone. When I got closer, I saw that they were actually just painting. Well then. I touched the lower part of the wall and finally figured out that the large blocks stone were actually textured plaster. 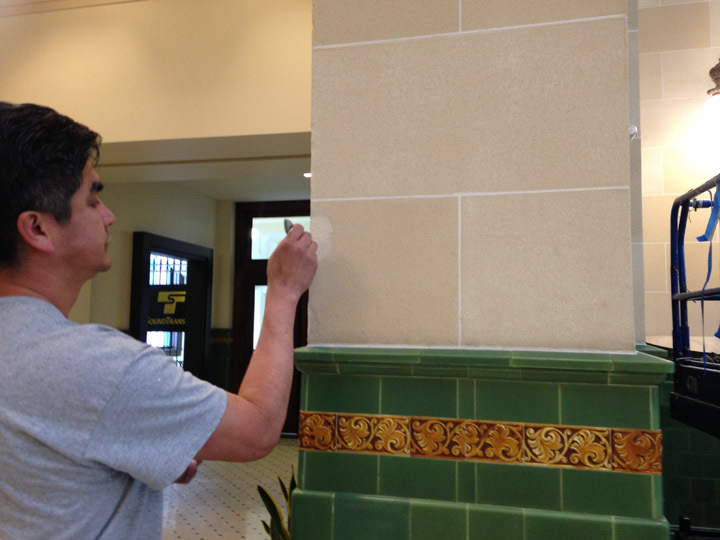 The “grout” lines between the blocks had been carefully taped off, rendered smooth, and painted yet another shade of off-white. I’ve done some faux painting in my time and this looked like the job from hell: a boring palette, a labor-intensive-yet-subtle finish that barely registers to the casual observer, a confusing rotation of annoyingly similar colors, ceilings and arches guaranteed to permanently disable one’s neck, and, of course, the absurd sisyphean nature of the task. The irony that I had taken a bunch of scenic and costume designers to draw a giant room full of scenery was lost on no one. In August 1907, in a 6 by 17 foot office under the original sidewalk here, a few messenger boys began the business which their many thousand successors extended throughout the vast regions of our country covered by United Parcel Service today. Exemplifying the opportunities open to private citizens under the Constitution of the United States of America, this plaque was placed in January 1967, with the cooperation and appreciation of the Seattle Historical Society. Take that, Commies, with your inferior state-run parcel services. As if you could order any stuff in the first place. Inside the imposing gate is a lovely and very loud courtyard enclosure, a private park open to the workers during workdays, filled with blooming plants, waterfalls, and, on this day, a horde of children who, like us, were out on a field trip. Model Travis swarmed by feral children at the birthplace of UPS. I grew up with five older siblings. We had around the house lots of books and toys from eras past, representing the accumulated passing interests of a slew of children. I never knew where most of the stuff came from or to whom it originally belonged. It was just there. 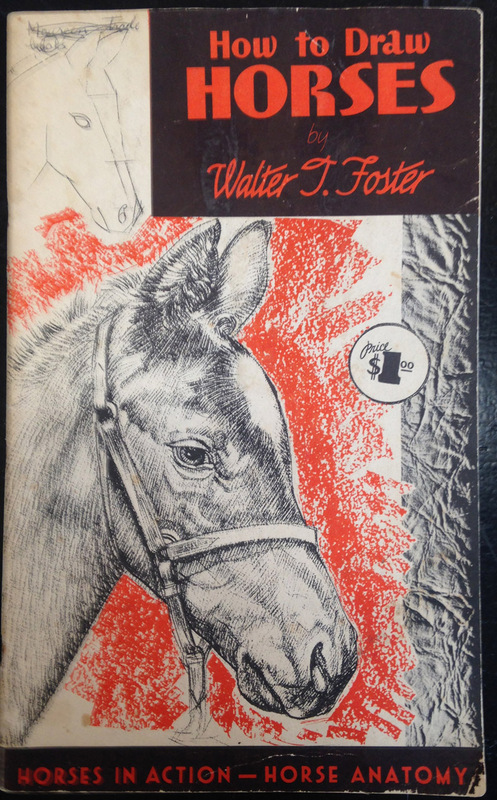 Of these random vintage possessions, the most influential on my development were two books by Walter T. Foster (1891-1981), “How to Draw” and “How to Draw Horses”. 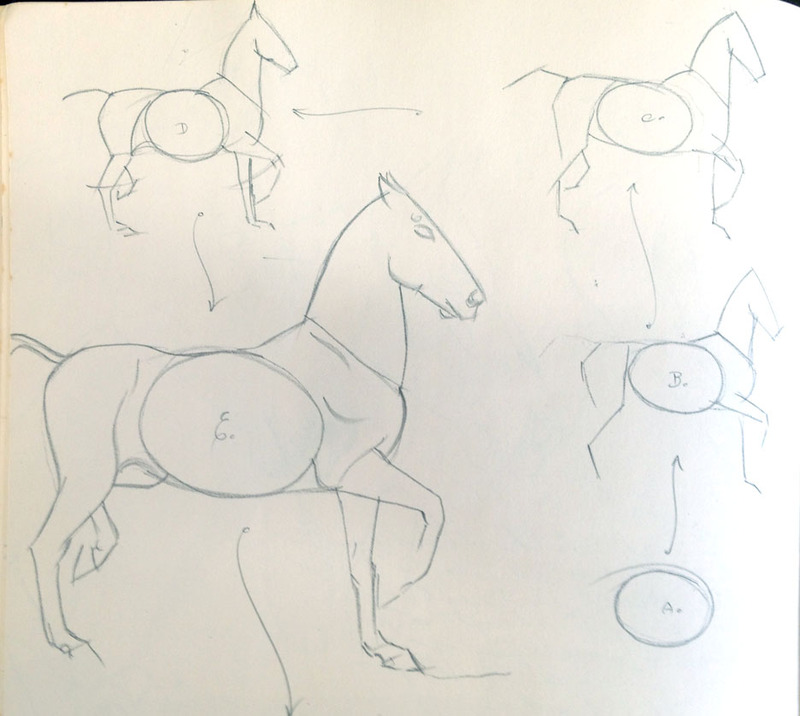 My cousin and I spent hours on end with the horse book, first copying the drawings, and then using his method of constructing the animal out of ovals, boxes, and lines (which also happened to be WTF’s method for drawing grapes, humans, landscapes, and most of the visible world). These kinds of how-to books are a remnant of a time in America when leisure time was newly accessible to a wider demographic (thanks, labor movement) and their proliferation testament to the new consumer hobby market publishers sought to tap. Most of the authors were successful commercial illustrators and admen pitching their foolproof, easy methods to a public with time on their hands and an admirable wish to better themselves, for fun or profit or both. 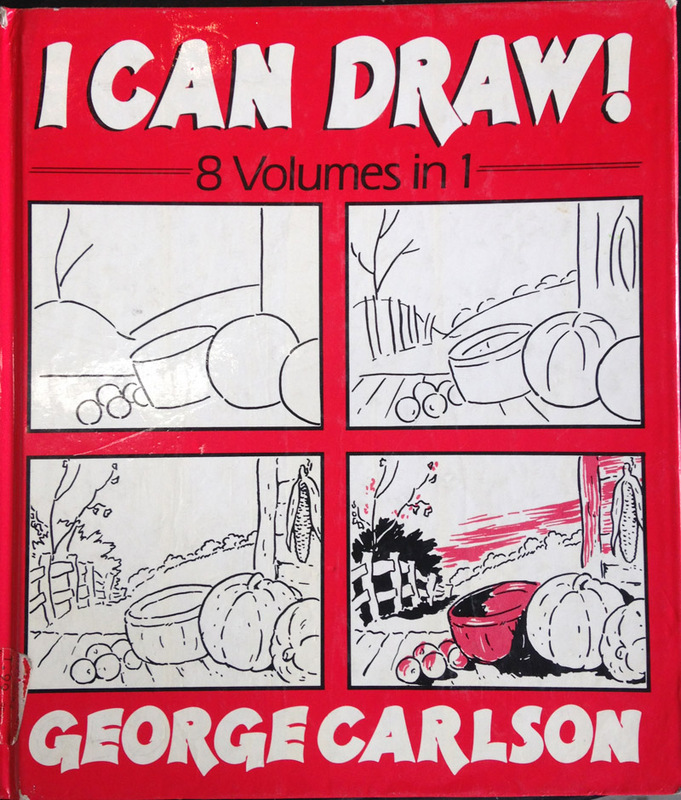 Unlike similar ventures into this market, for instance, paint-by-number, these books actually taught you a skill, and could be a starting point for a budding serious artist who found them lying around the house. 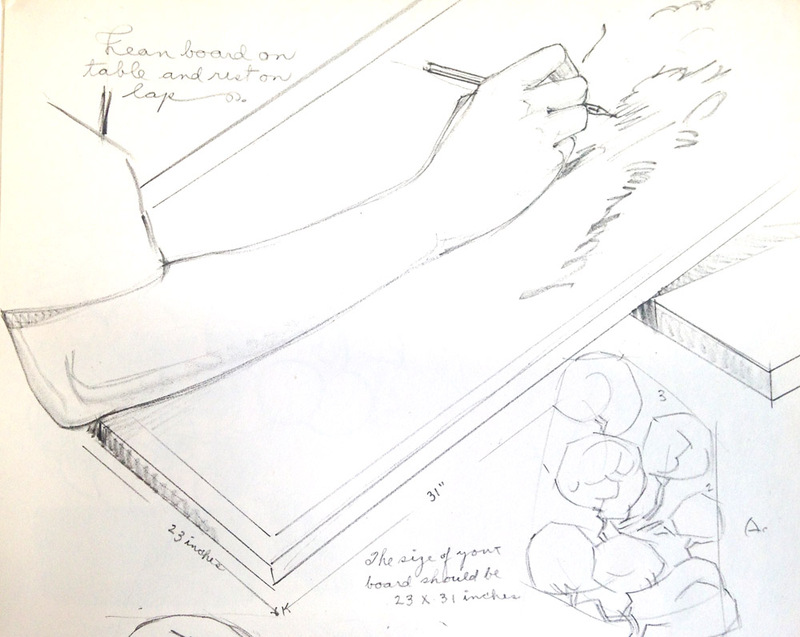 They vary widely in their usefulness, production values, and applicability to fine art, but they all share an insistence that ANYONE CAN LEARN TO DRAW! These are a few from my present-day collection. Walter T. Foster was possibly the most prolific of the bunch, and he was more geared toward realism than those who were riding the comic book wave of the 1940’s and 50’s. 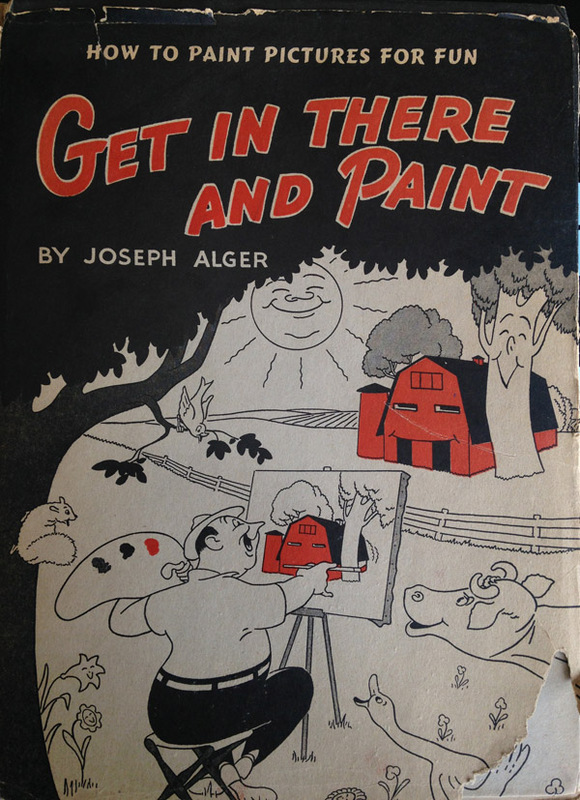 He began his own publishing company, Walter T. Foster Publishing, which produced other artists’ how-to books as well as his own. 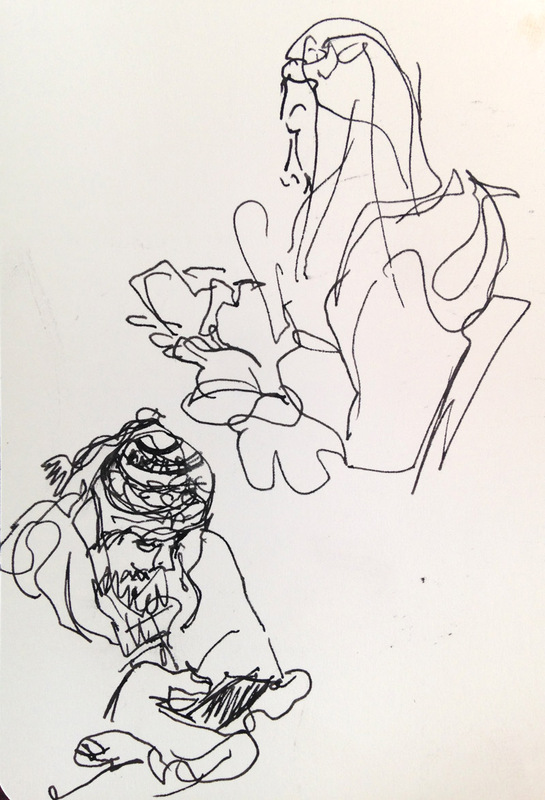 Possibly one reason he could be so prolific can be found in the off-the-cuff, sketchbook quality of his books. 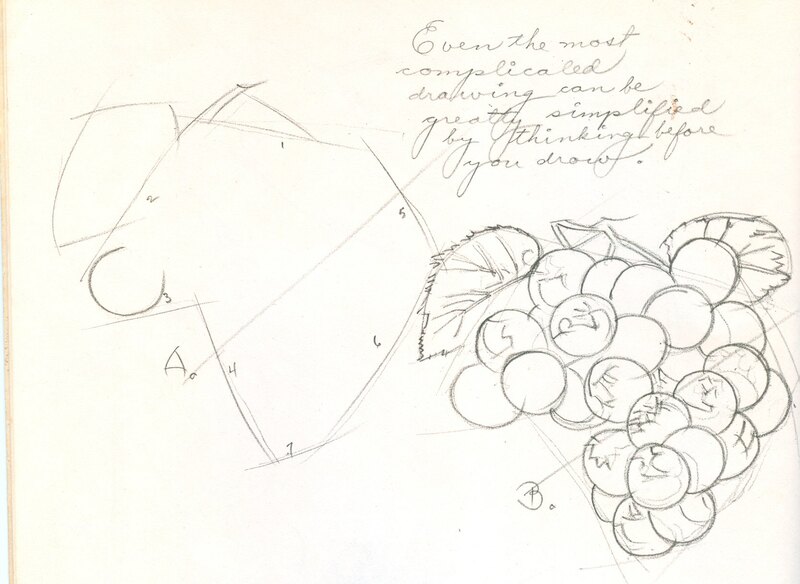 They are full of bits of advice, hand-written in pencil, that usually, but not always, correspond to the illustrations, as if he just remembered something important and had to write it in the interstices of the drawings before it slipped his mind. 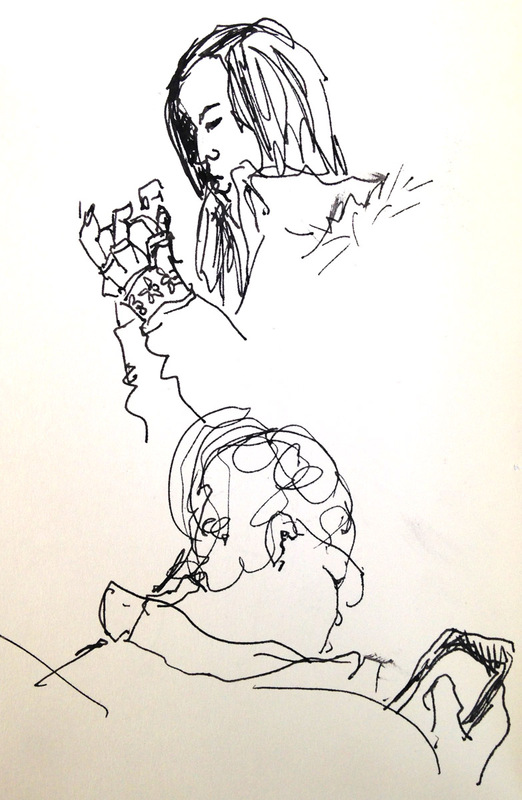 Sometimes the drawings run right off the page. 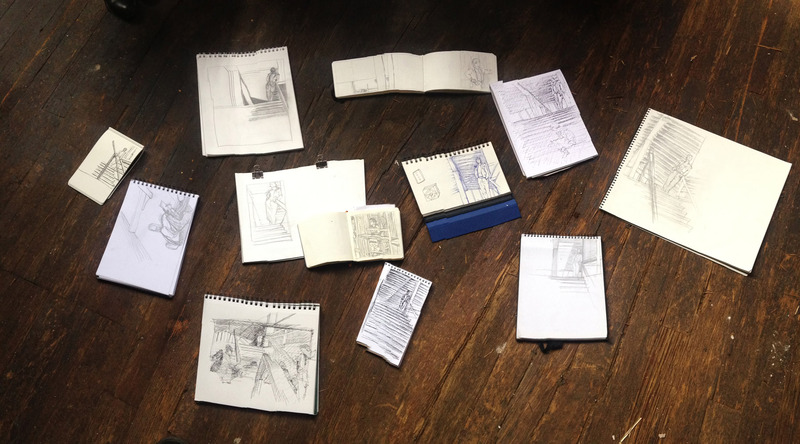 Possibly they are just his sketchbooks, barely edited and annotated. Don’t hold to any cut-and-dried rules. Think for yourself and apply what you learn from all sources. Fine, go ahead, but if you have trouble just know it isn’t an easy thing to do. 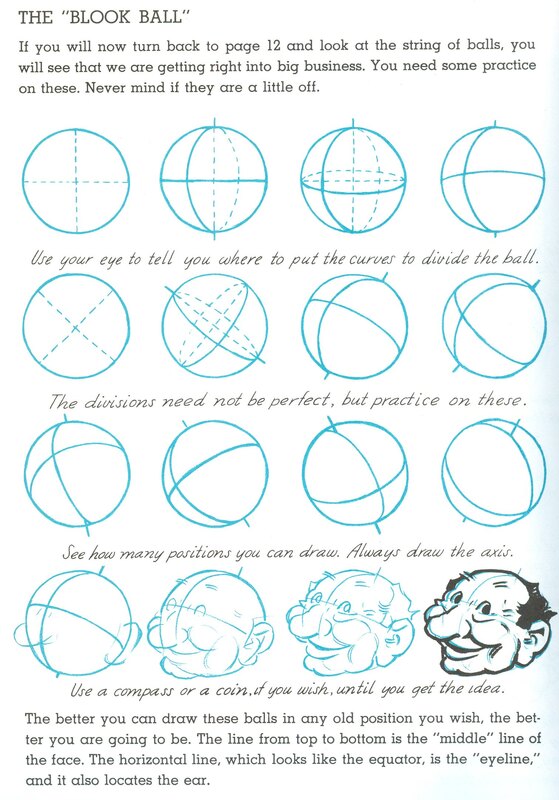 The irrepressible Andrew Loomis, author of “Fun With A Pencil”, mixes instructions for drawing cartoon caricatures right in more with realistic figures and perspective theory. 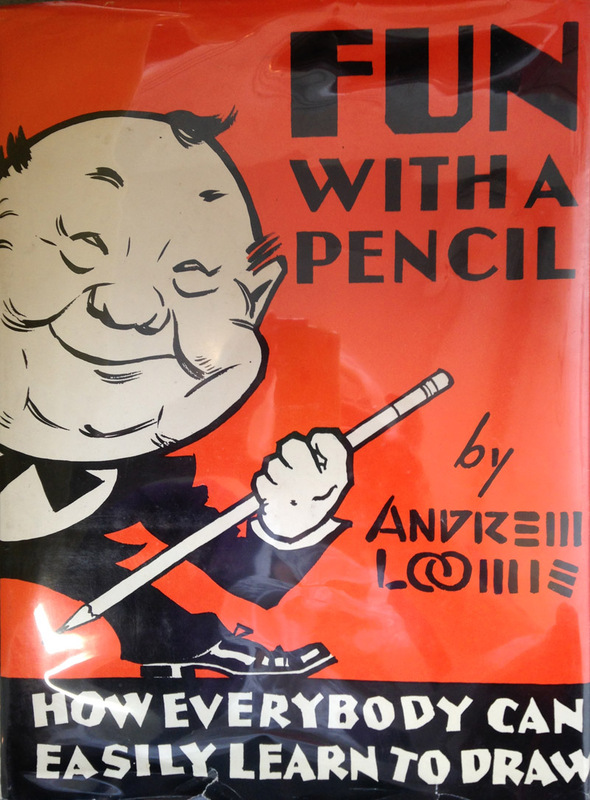 His formulas are rather more formulaic, but he also proves a pleasant companion for your drawing journey. 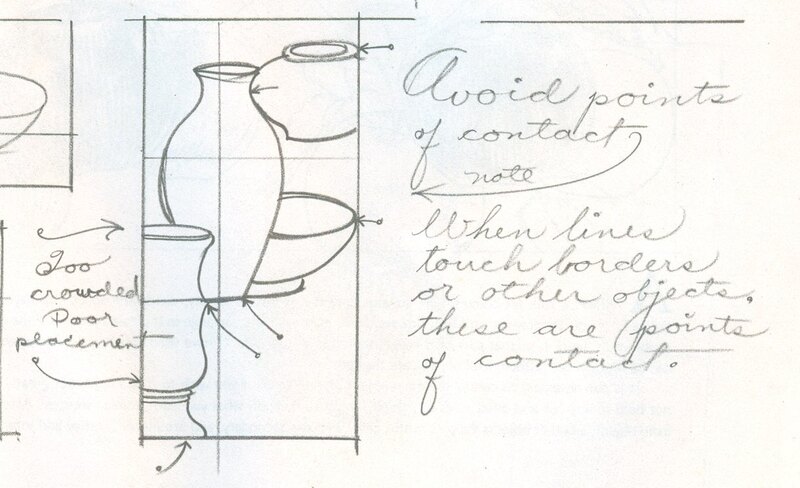 “Never mind if they are a little off” is timeless advice for learning any new skill, and people particularly need to hear it when they’re drawing, since the disastrous results of early attempts are always staring you in the face. The ideal American is not only white, chiseled, and afflicted with lines all over their face, but is also possibly transgender. Note the identical features transposed from Mr. 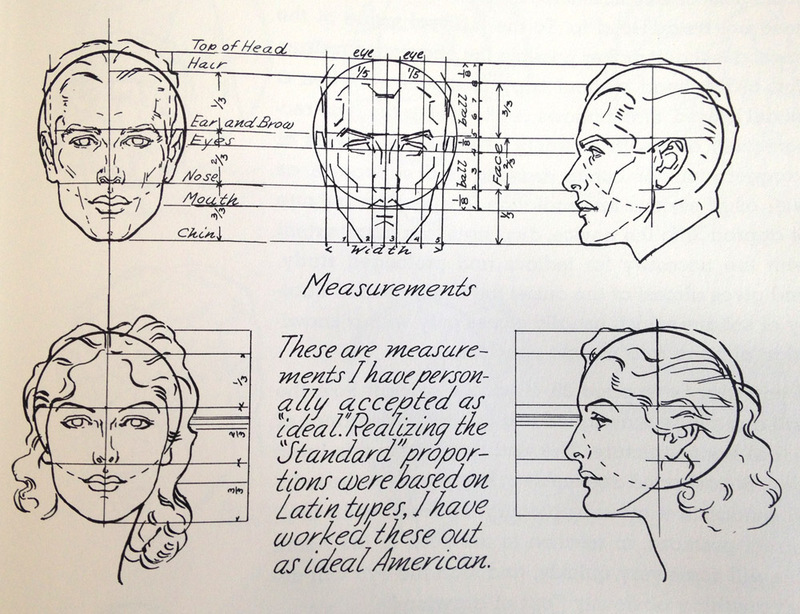 Ideal American to Ms. Ideal American. 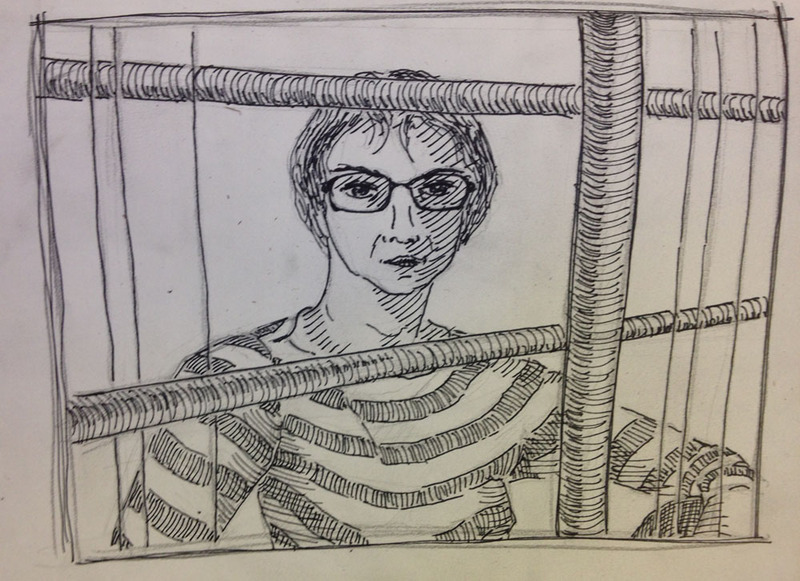 Actually, I do hand out a version of that formula to beginning students tackling portraits for the first time. I find it helps them to see what’s in front of them, and usually if not always keeps them from putting the eyes at the very top of the head. I do add the warning, “actual results may vary,” which one should keep in mind regardless of the subject’s ethnicity. I’m not entirely sure what this diagram is supposed to represent. It doesn’t even really make sense internally: why is the brow line perpendicular to the ear line? And, besides, one should NEVER use a real knife to draw another human. While we’re at it, let me also state that real children should never be allowed to play unsupervised with perspective. 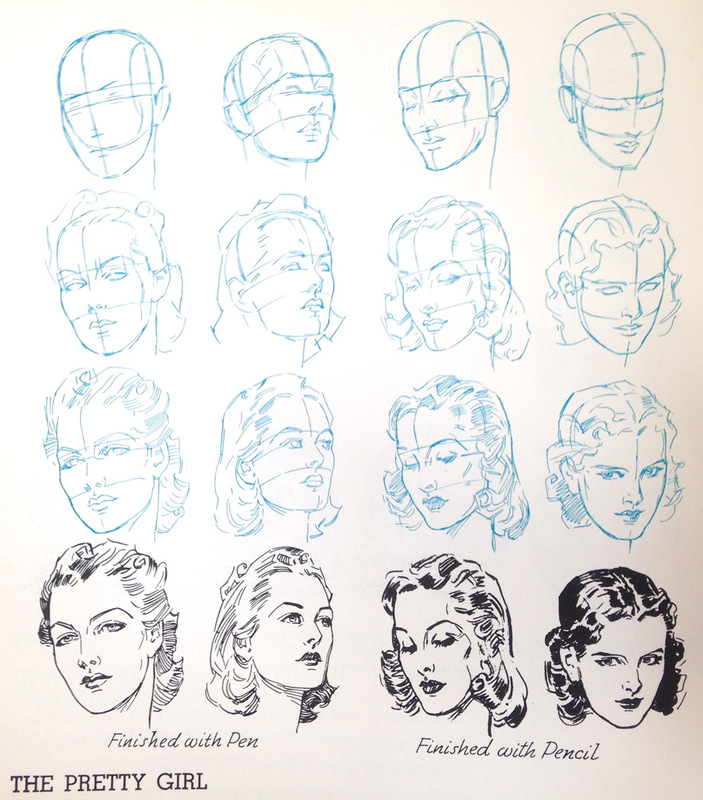 Next to the Ideal American, the most important formula for the budding commercial illustrator to have in their back pocket was the Pretty Girl, the pleasingness of which, according to Loomis, is “99% in how well you draw it”. Incidentally, this validates Jessica Rabbit’s oft-quoted observation that she wasn’t bad, just drawn that way. 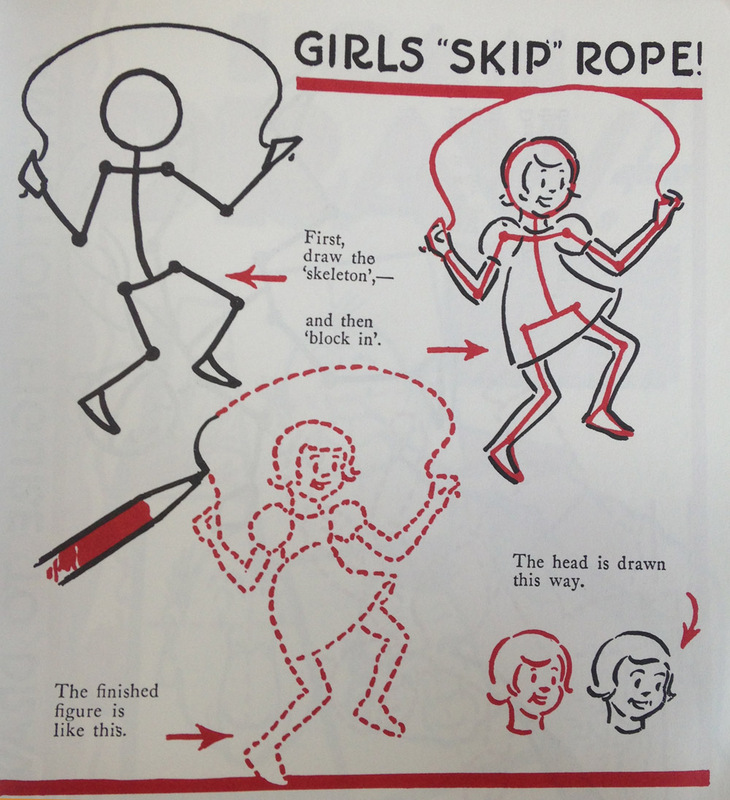 Even into the late 1960’s, it was still important to keep those gender roles straight when learning to draw. 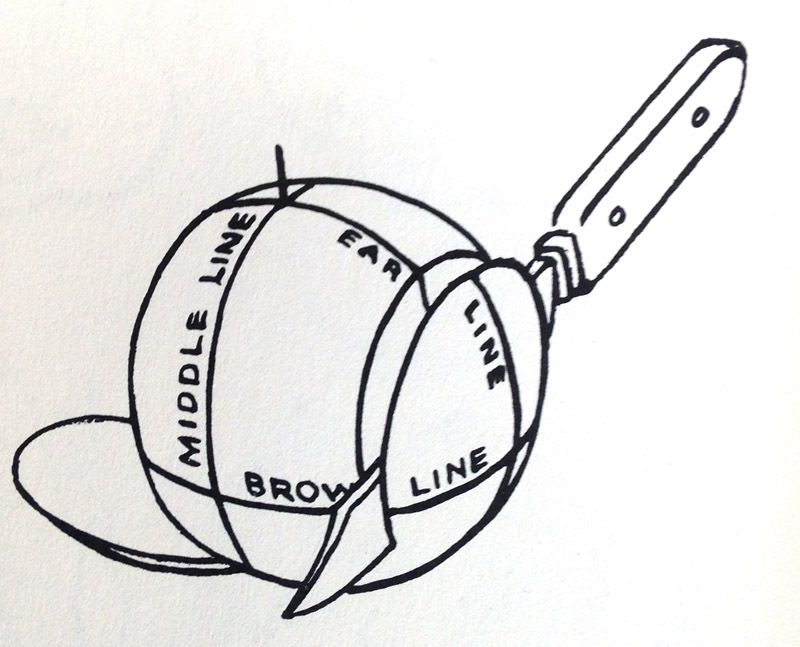 George Carlson, author of “I CAN DRAW!”, from which those were taken, was no Walter T. Foster, but WTF is a valid response to these unhelpful diagrams. 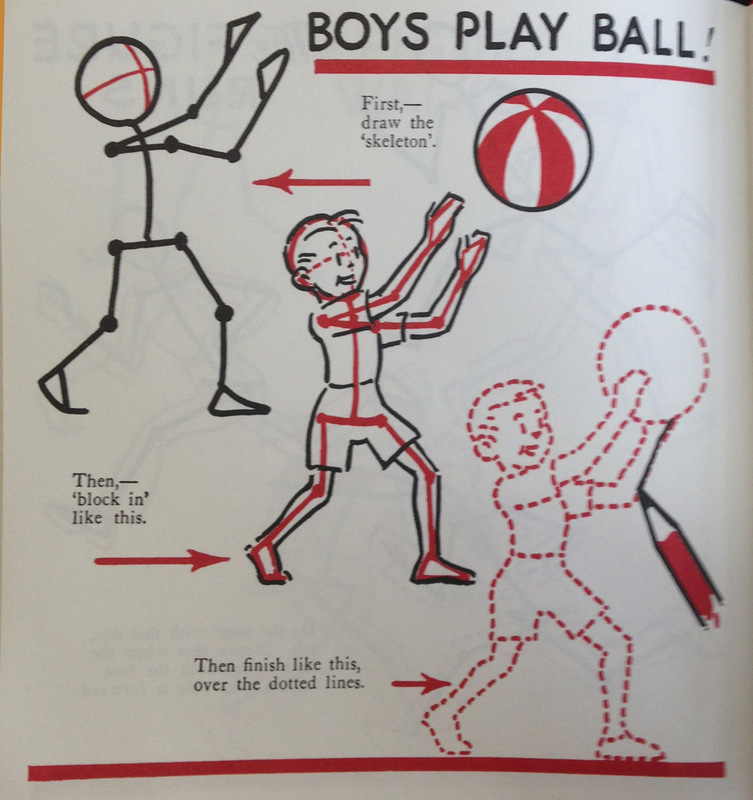 This book was aimed at children, but evinces little respect for their ability to distinguish drawing from tracing dotted lines. What is “The head is drawn this way” supposed to mean? Those are two identical pictures, except one is red and one is black with an arrow pointing toward it, but no further instructions. 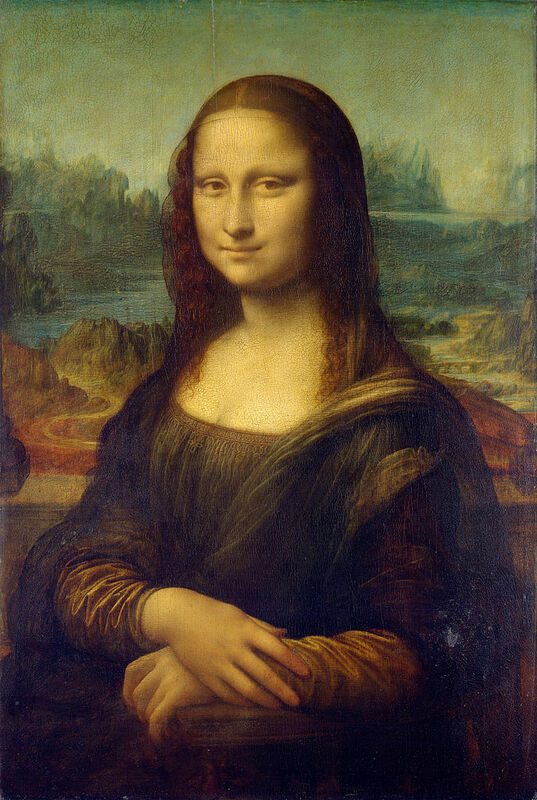 Mona Lisa is painted this way. W.T.F. himself wasn’t immune from the illustrative conventions of his time, either. 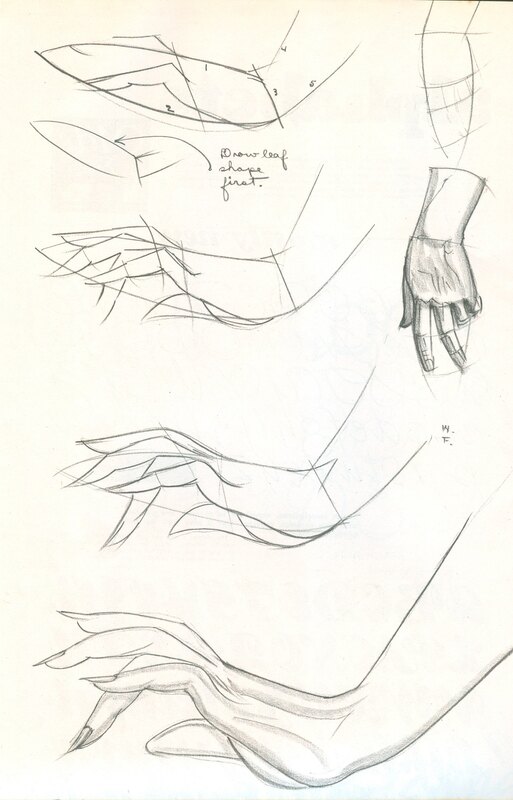 In his books, men’s hands are to be drawn realistically, while ladies’ hands tend to taper unnaturally. Hands are not easy to draw and you should devote much time to them. 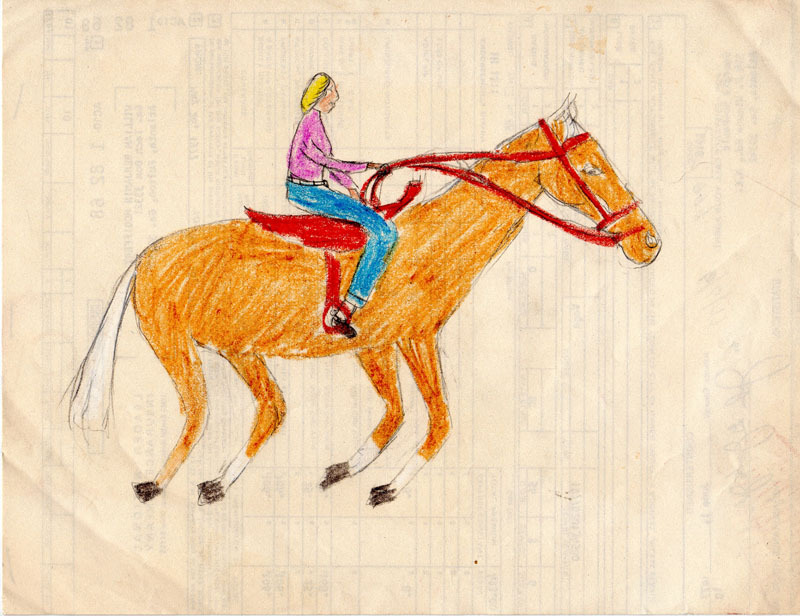 Horse by the author, circa 1970’s. 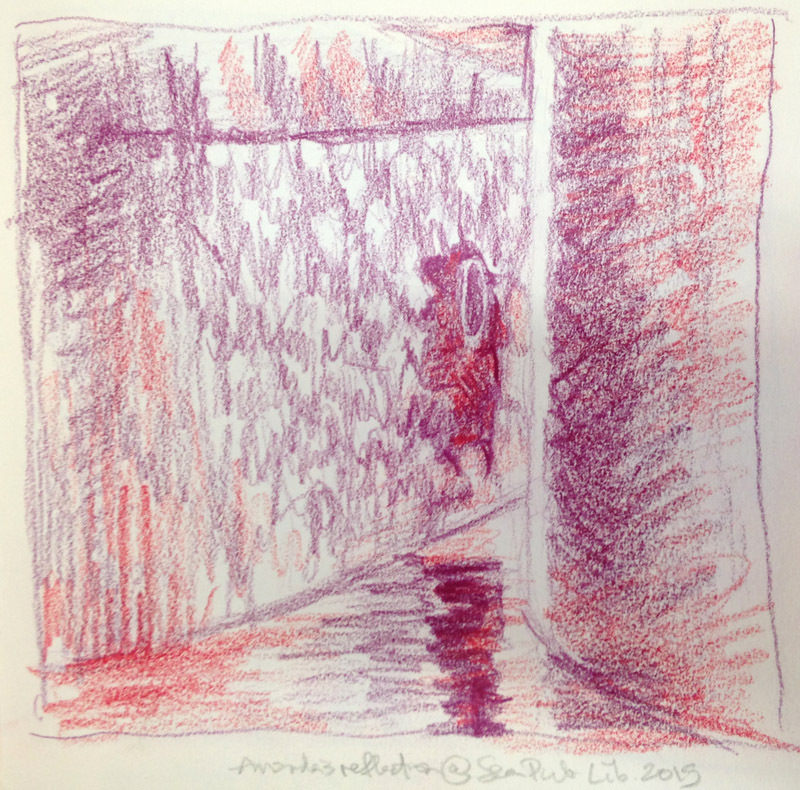 Crayon on found office paper. Draw everything you see, it will come in handy when you start making a living at it. Sure you can. Try. 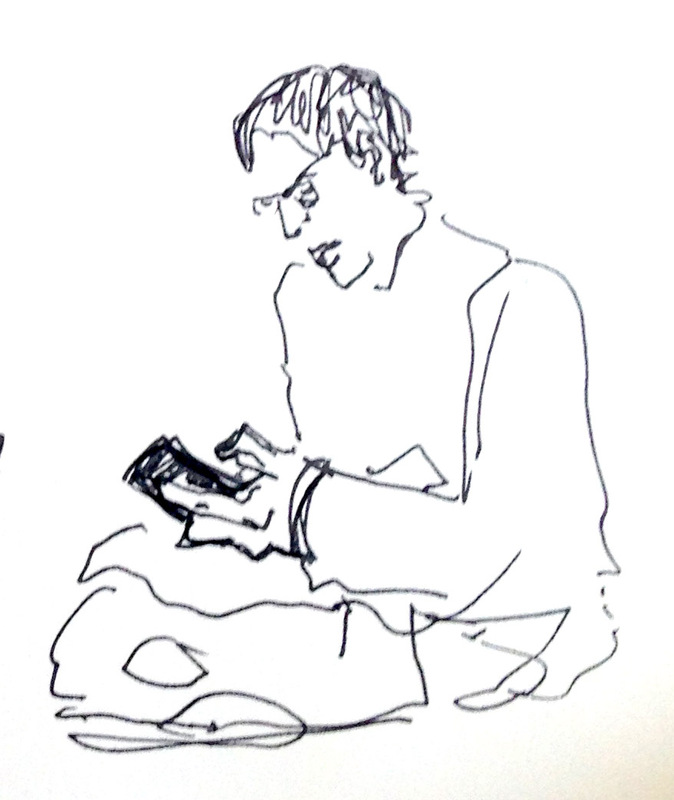 The screen stare/phone fondle: a posture so perfectly emblematic of our cultural moment. 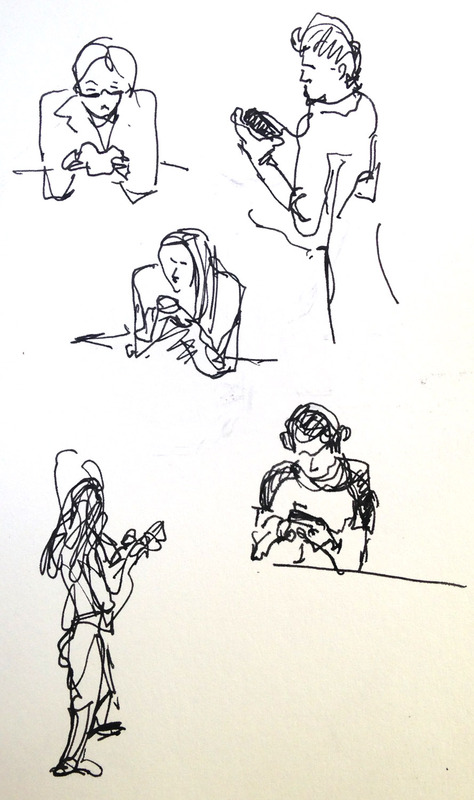 When these distracted creatures are not running you down on a city sidewalk, they make excellent drawing subjects. There are ample opportunities for drawing people in this classic pose. Personally, my preferred setting is the bus. 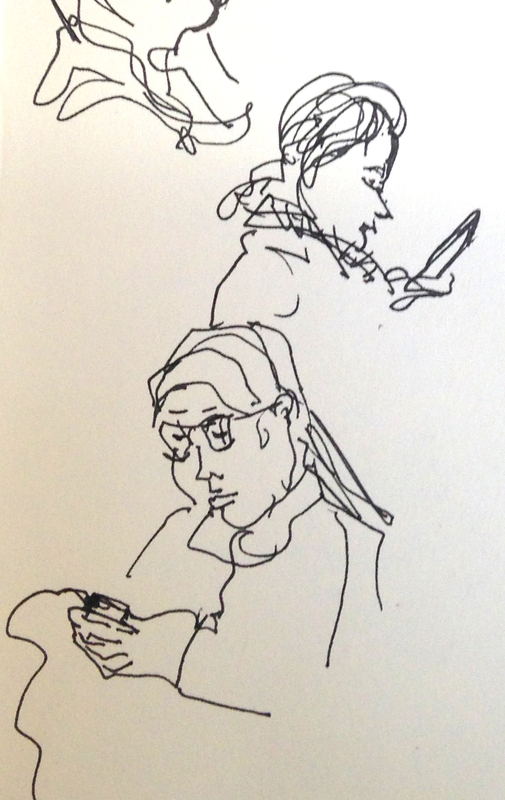 Invariably, subjects are so enraptured by their devices they remain stationary for long periods and almost never notice that they’re being drawn. Sometimes they hug their phone so close, I feel like I’m intruding on an intimate moment. 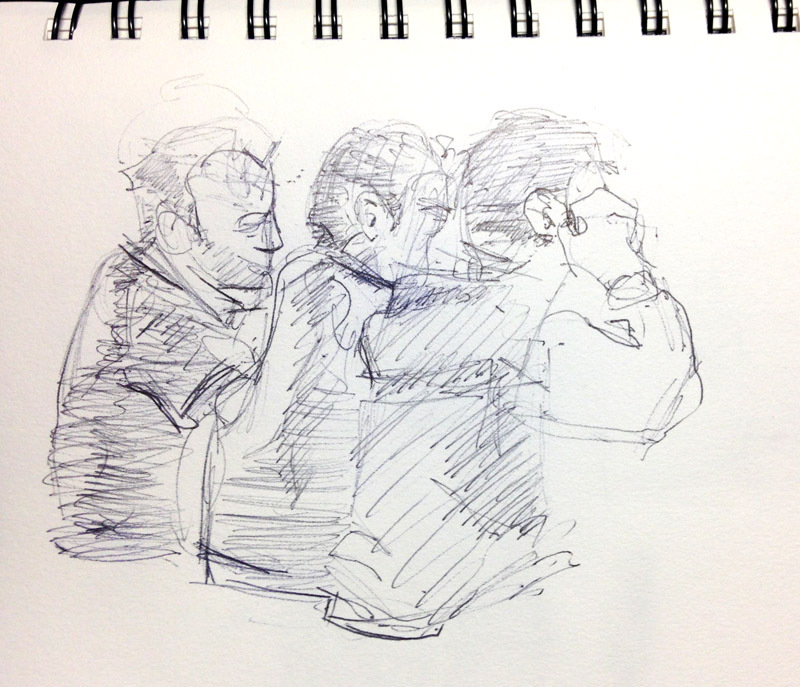 It’s a good opportunity to draw moving hands quickly, and usually that’s the only thing moving. 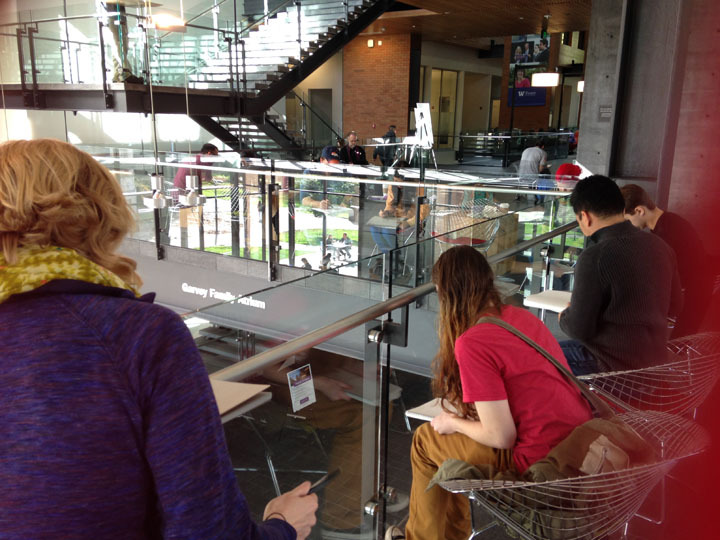 Here are some students in the business school cafeteria at the University of Washington. The gentleman below appears to have sprouted an unusually large thumb. Should this make him more effective at navigating, say, dating sites, the trait might have a selective advantage and we could see many more of these in future generations. My UW Drama grads and I made our annual pilgrimage to the spectacular Seattle Central Public Library in November, accompanied by the ubiquitous and always-stylish model Amanda, dressed to match the architecture in a pattern of multicolored trapezoids that referenced the steel grid covering the building. 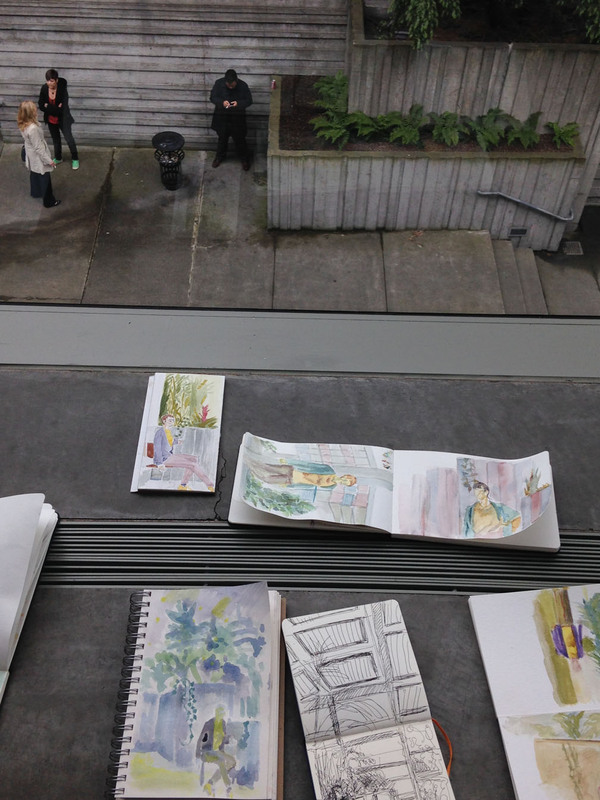 We met up at nine and had an hour to kill before the library opened its doors, so we engaged in a bit of guerilla urban sketching in a large office building across the street. Usually this sort of thing goes well for me, attracting generally positive attention and curiosity. This time it got me in trouble with the building manager. Talking fast yet amiably, I managed to successfully convince her that we were harmless, and by the end of the conversation she was dragging chairs out of the cafe for us to sit on. The epic Henry Moore sculpture in front of the building had apparently given me a falsely arty impression of the building; like many corporate glass and steel towers, it boasts an impressive, artfully furnished, and utterly underused lobby. Heck, we were doing them a favor, “activating the space” as they say in urban planning parlance. At the library, by contrast, we were warmly greeted by event services manager Cara Cronholm, who has been welcoming my classes there for the last several years. 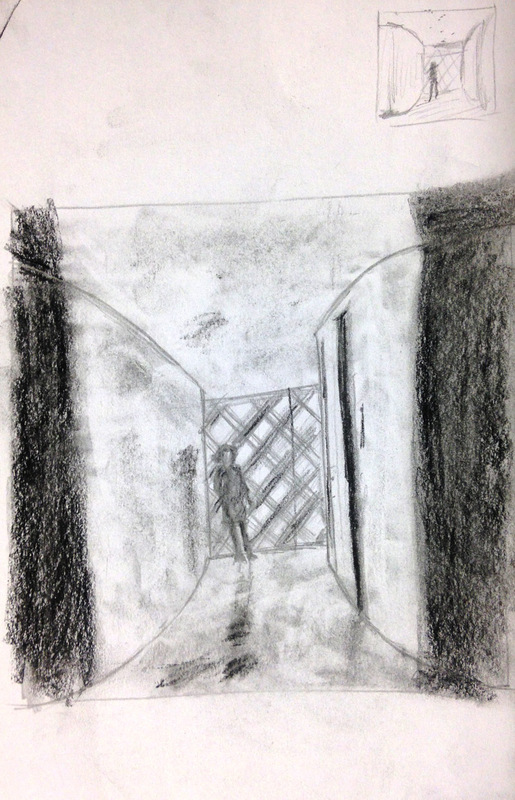 We began in the fourth-floor shiny red organically undulating hallway, where the utter strangeness of the space forced everyone to actually look at their surroundings rather than fill in from whatever is in their head. You can’t make this stuff up. 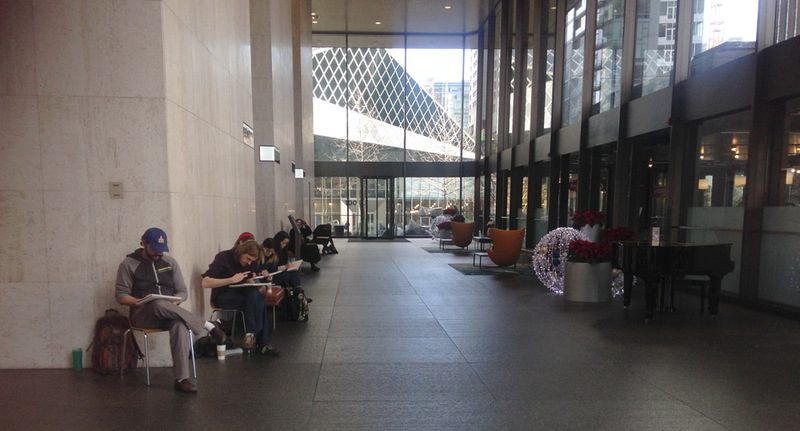 For the second pose in this area, Amanda stood down a narrow side hallway from us, backlit by the capricious Seattle winter light projecting through the harlequin grid of the library’s exterior. Everyone had to sort out and filter the cacophony of colored light, reflections, and reflections of reflections to interpret the scene for themselves, resulting in a great variety of compositional and material choices. Onward to the tenth floor to visit the Reading Room , although I don’t know how anyone can get any reading done surrounded by that visual feast of geometric pattern, light, and encompassing views of the city all around you. 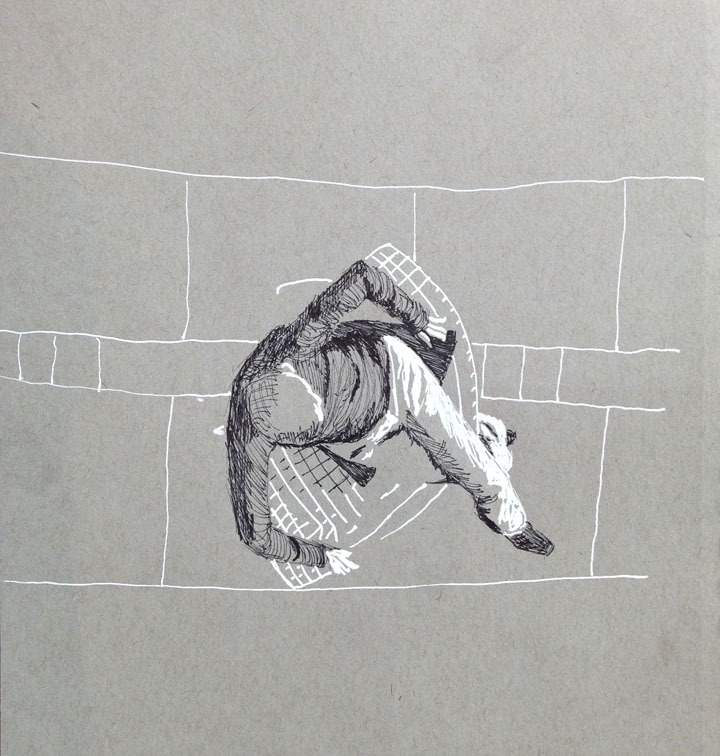 While there’s plenty to be said for the time-honored practice of academic study of the human form in a controlled studio setting, humans exist in historical times and physical places. 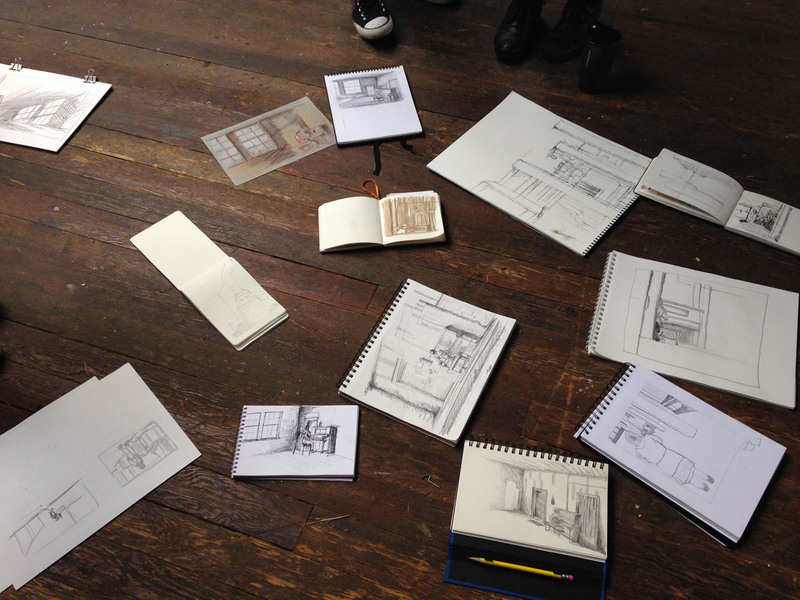 Judging from the work done by even the least-experienced drawers among us, inspiration for theatre, painting, and any other visual art can be had in abundance just by getting out in the world and drawing them there. 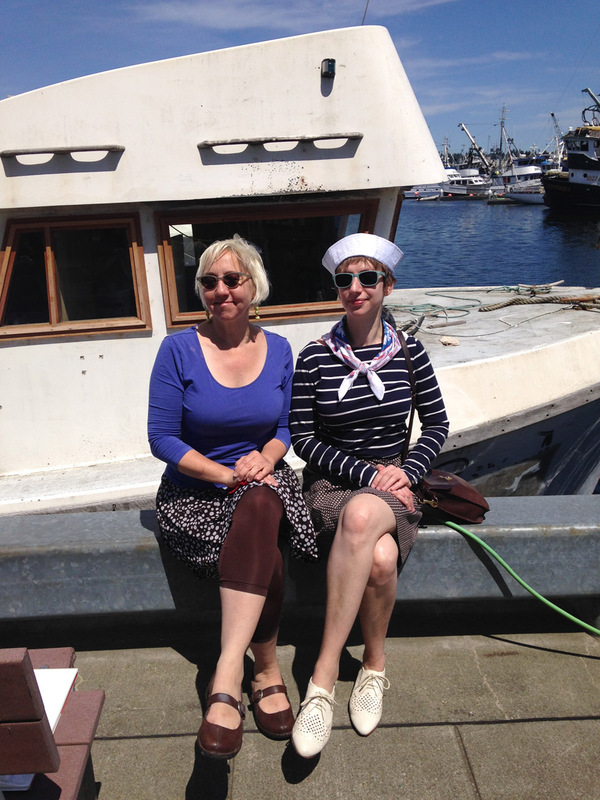 The University of Washington Drama drawing class wrapped up with a field trip to Fishermen’s Terminal, a moorage for both working and pleasure boats, with restaurants and services for fishermen and -women. We we accompanied by our intrepid and always-dapper model Amanda. 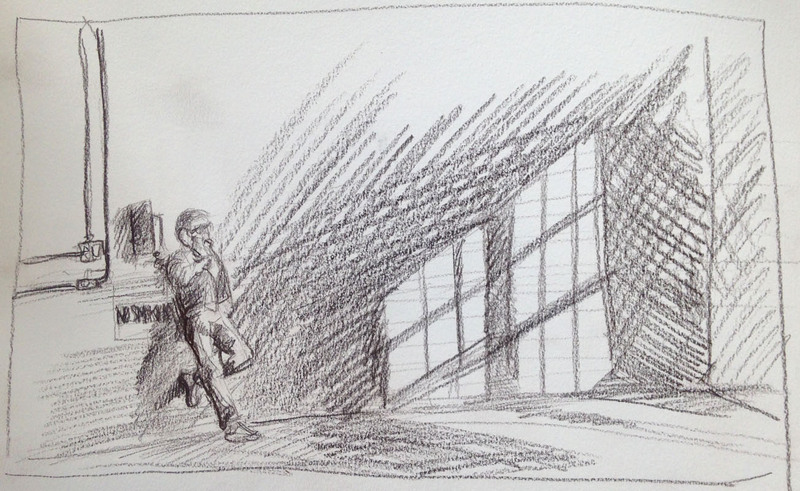 Context brings so much life to life drawing, but is inexplicably left out of most figure classes. There is, for one, the light to contend with, changing the color, bouncing around, casting shadows, and reflecting off of water in this particular situation. Here is everyone’s first go at tackling the complicated scenery, with its plethora of vertical masts and fenceposts. The scale of the boats in relation to the figure also presented interesting composition problems. Less expected was the element of text: Boats have names, and those names are writ large. Artists sometimes freeze up when confronted with text. They go into what used to be called left-brain mode and forget how to draw. 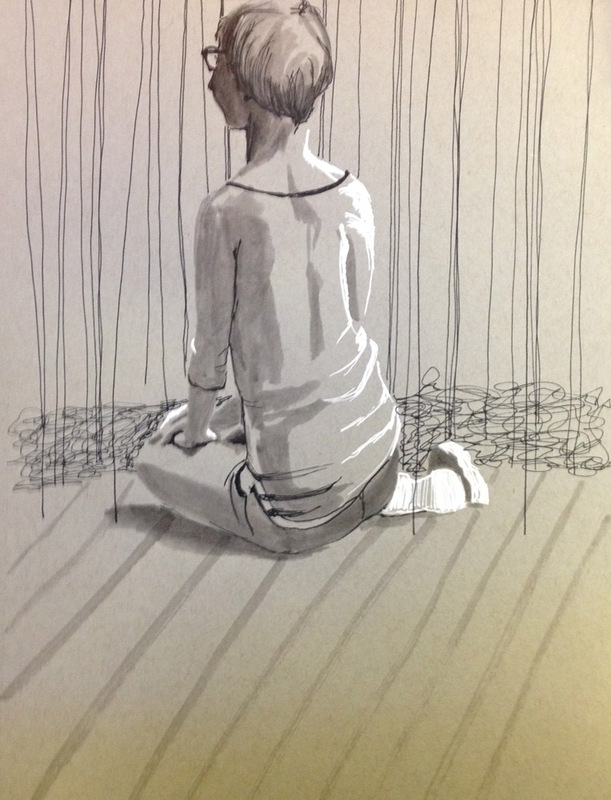 Words have a way of obliterating the rest of the drawing. 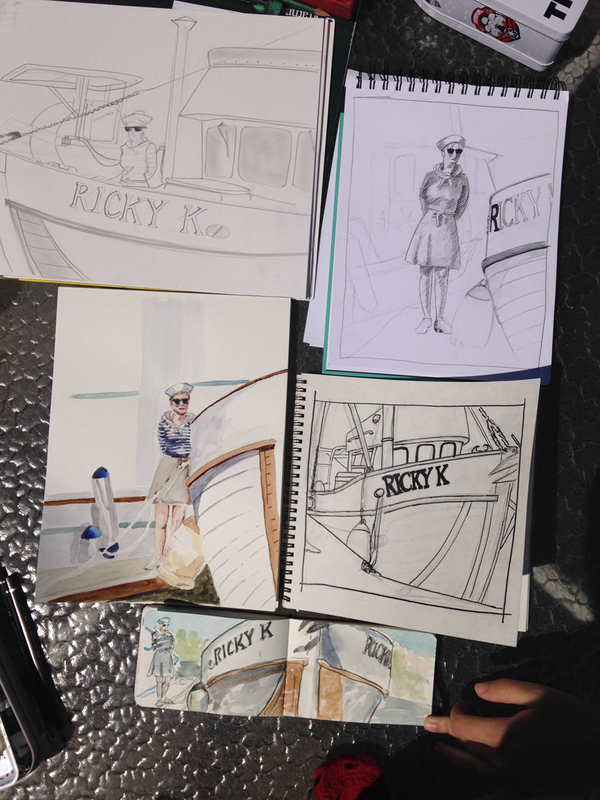 Something about “Ricky K “, however, was so juicy and tempting that most of the students (and I) wanted to tackle it. 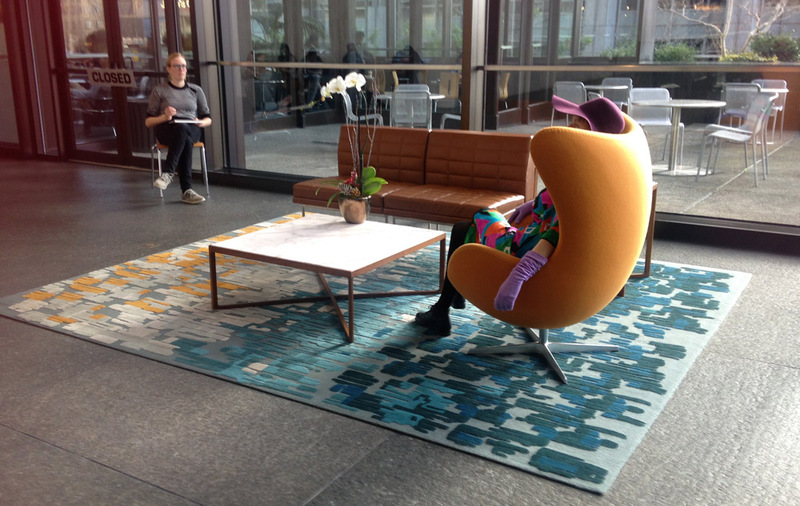 Those who included it really succeeded in keeping it in its place as a visual element. 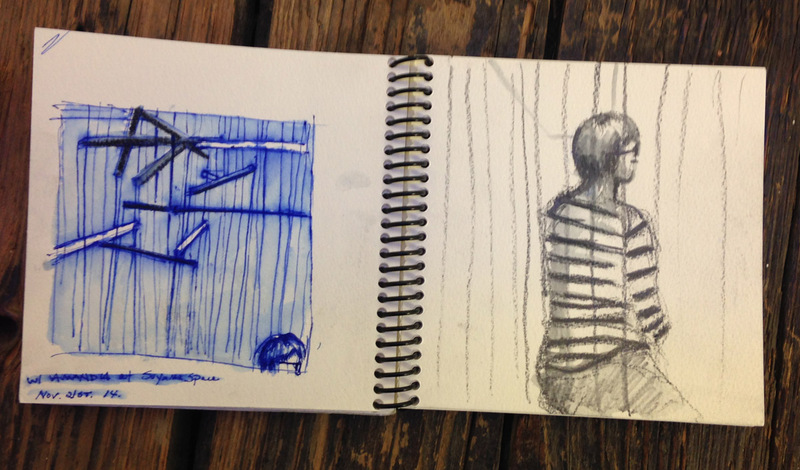 The drawings hold together, in spite of being so texty. 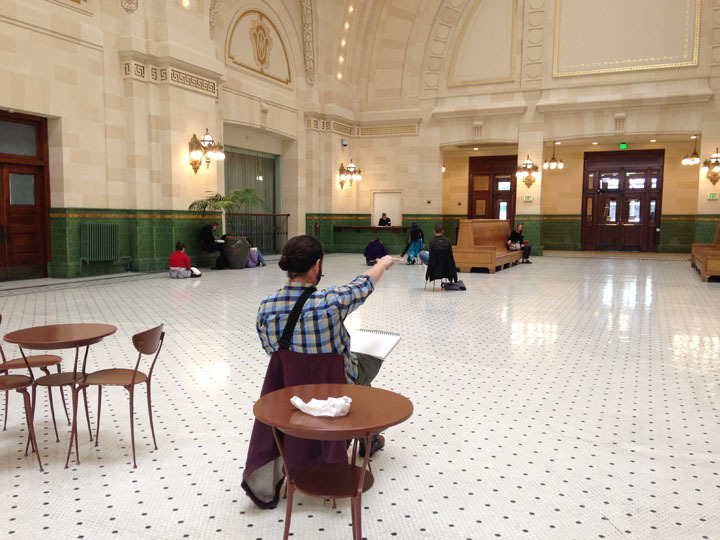 My polka-dotted skirt appears twice in in this peripatetic panoramic photo of the last pose of the year. Make that second-last pose, since Amanda’s and my coordinated outfits also begged to be documented. 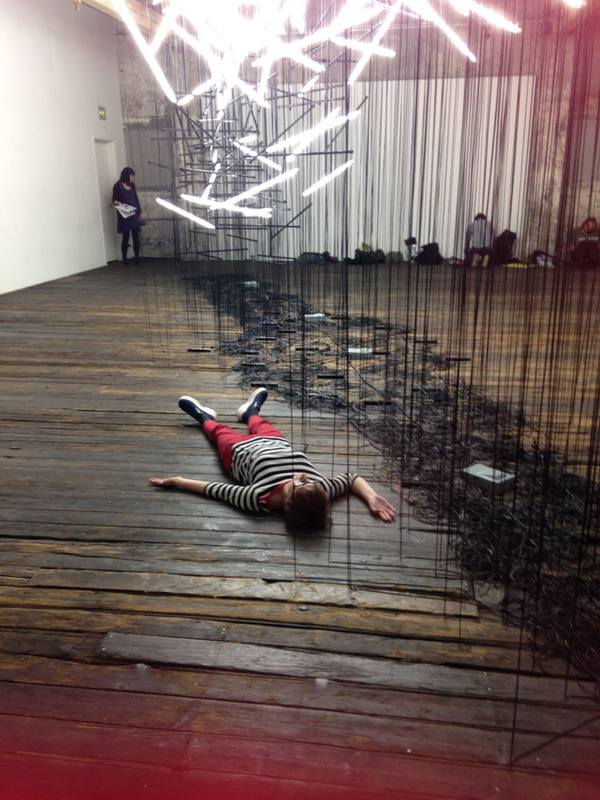 A couple weeks ago, I took my lovely UW theatre designers on a little field trip to Suyama Space to draw “Never Finished”, a room-sized installation of cascading fluorescent tubes by the artist team Lilienthal|Zamora. 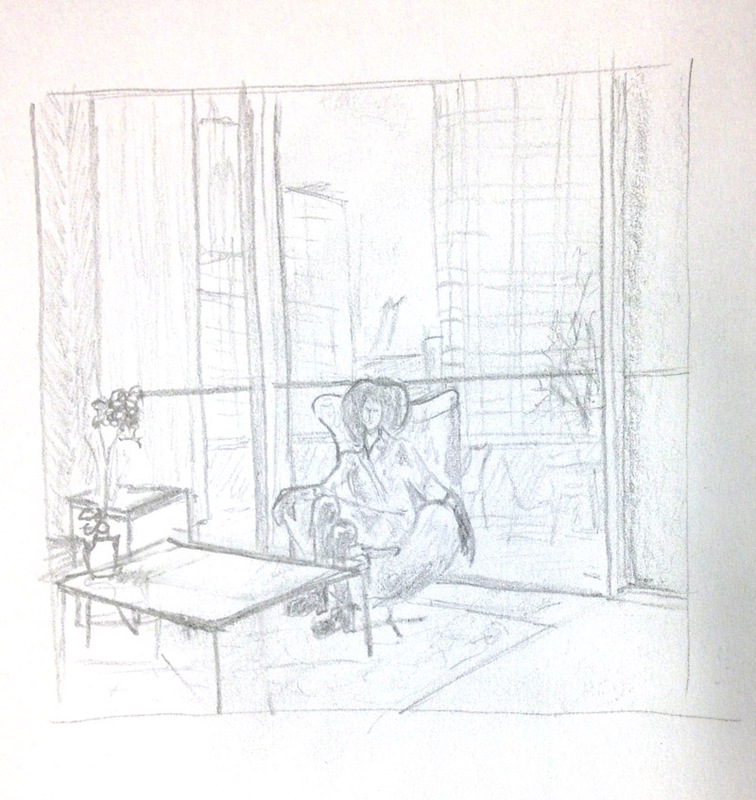 Since this is after all a life drawing class, we were joined by our favorite field-trip model Amanda, who added human scale, narrative, and some additional pattern to the glowing, seriously maximalist landscape. Here is an excellent example of zooming in on the particular. 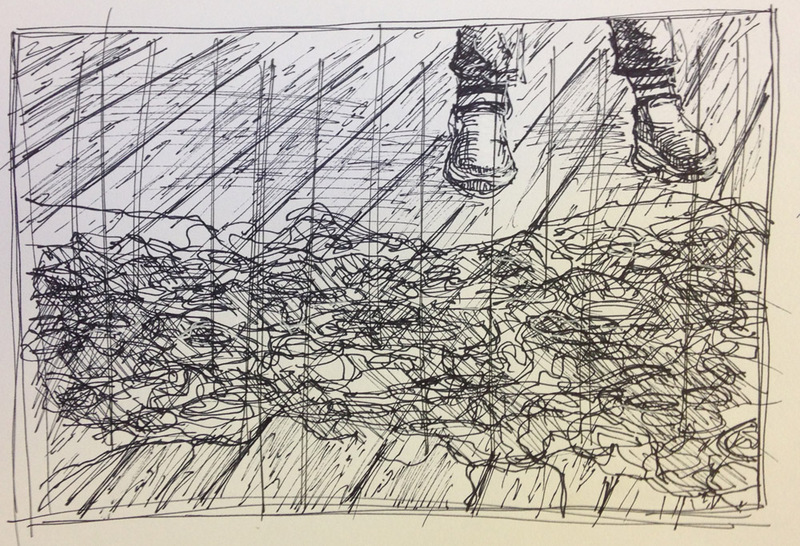 Even though she likely wanted to draw every last light bulb and stripe on the shirt, she controlled that urge and instead focused on the splendid river of cords weaving through the texture of the floor, the verticals, and a pair of feet, which add a provocative hint of potential movement. 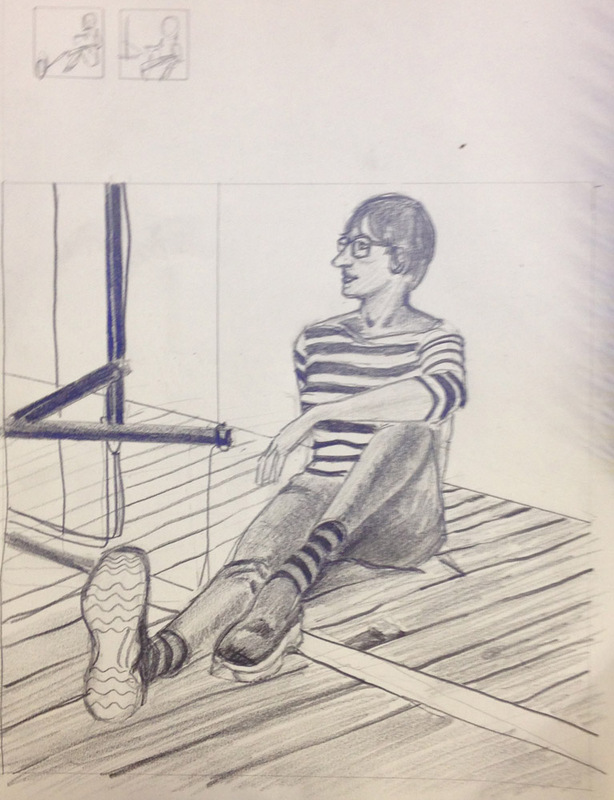 This student solved the problem by dividing the picture plane into three sections of distinct pattern, with the figure anchoring the whole composition, and almost reading as a marionette. Ballpoint pen proved a popular medium for this project. Even though the piece strikes you first with light when you experience it in person, it turned out to be its richness of line that was most compelling to draw. 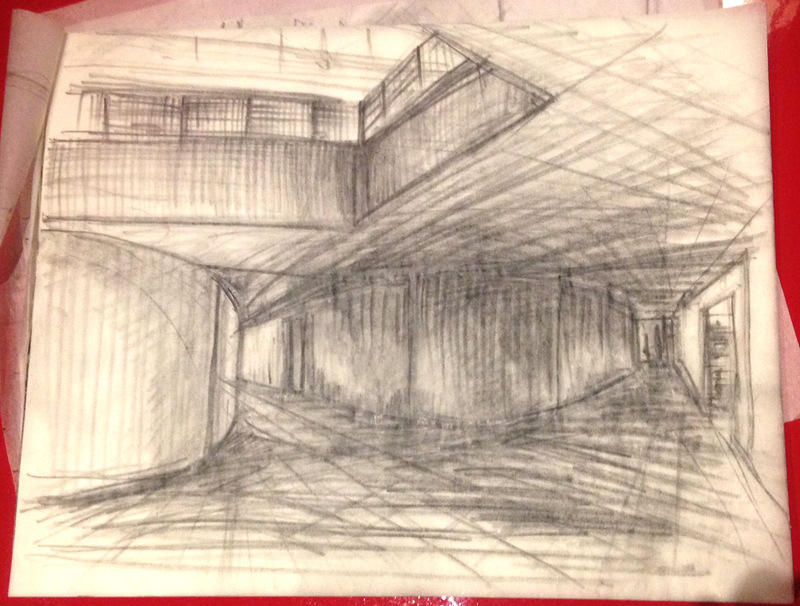 The tubes flow from order to chaos and (almost) back again as you go from one end of the room to the other, mirroring our process of drawing, in which we attempt to impose our own visual order on what we see. A blue ballpoint pen with a little water added to smear it, set off nicely in this photo by the space’s beautiful rough-hewn floorboards. 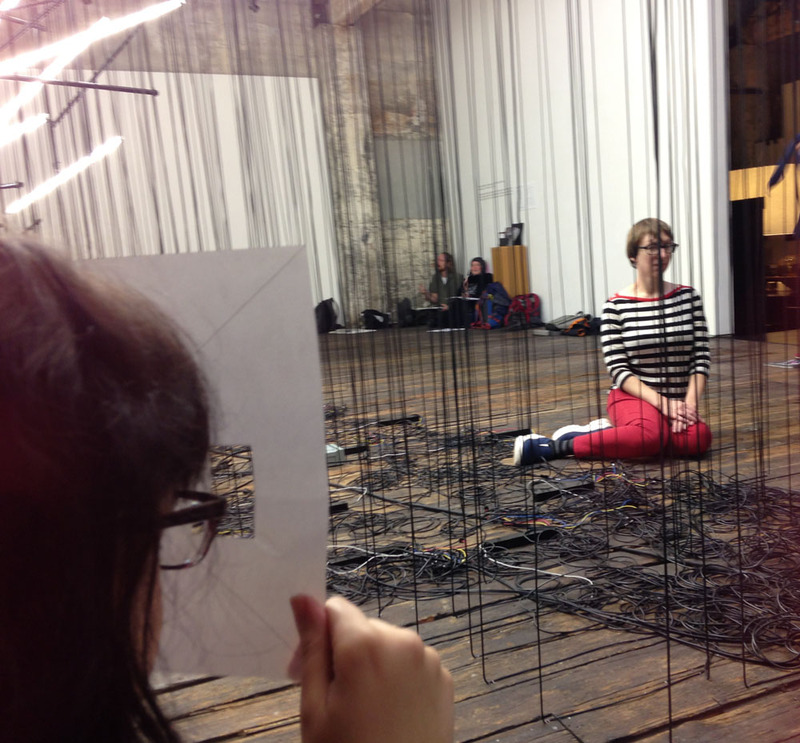 Below is a panorama of the entire room, from the model’s point of view. Never Finished comes down December 19, so you’d better hurry if you want to see it . 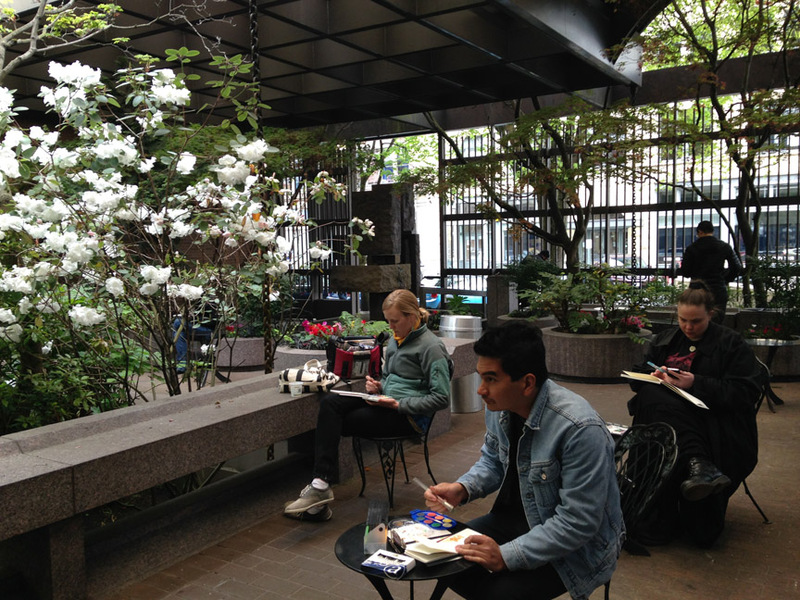 . . and bring your sketchbook! Apparently the good dive bars still left in Seattle are in the suburbs. For our final session of “Life Drawing in the Real World”, we took a little excursion into the eponymous real world to draw the locals. 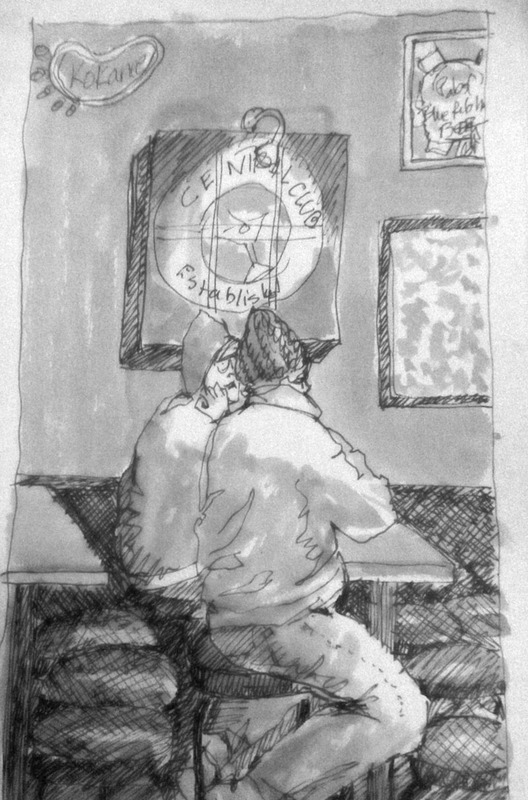 I found the Central Club in downtown Kirkland, Washington through a quick search of Google maps: The interior camera shot told me it was the place, which was confirmed when I walked in and was immediately greeted warmly by the bartender and the three regulars sitting at the end of the bar. Everyone was so friendly, I thought for a moment I was back in Cleveland and not in the reputedly chilly Pacific Northwest (which reputation is greatly exaggerated, by the way). 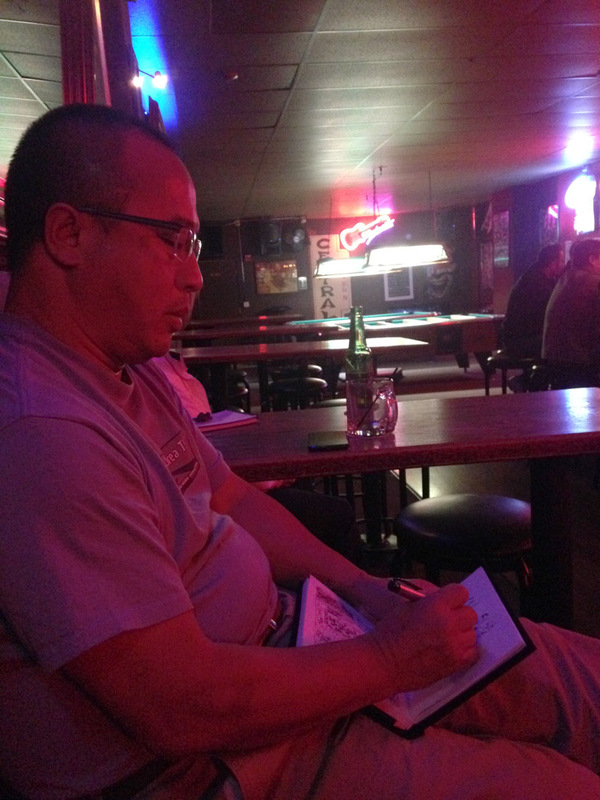 Since the bar was nearly empty and my students would soon outnumber the other patrons, I figured it was best to tell these nice people what we were up to. People’s reactions over the course of the evening ranged from enthusiasm, to utter indifference (which is what you want), to the single hostile inebriated patron who soon forgot the point she was trying to make about the questionable legality of our activity. People lined up at a bar actually make a nice composition, and tend to stay put. Before the bar started filling up, they were our only choice of human subject, along with their busy liquor-bottle-and-lottery-poster-dotted backdrop. 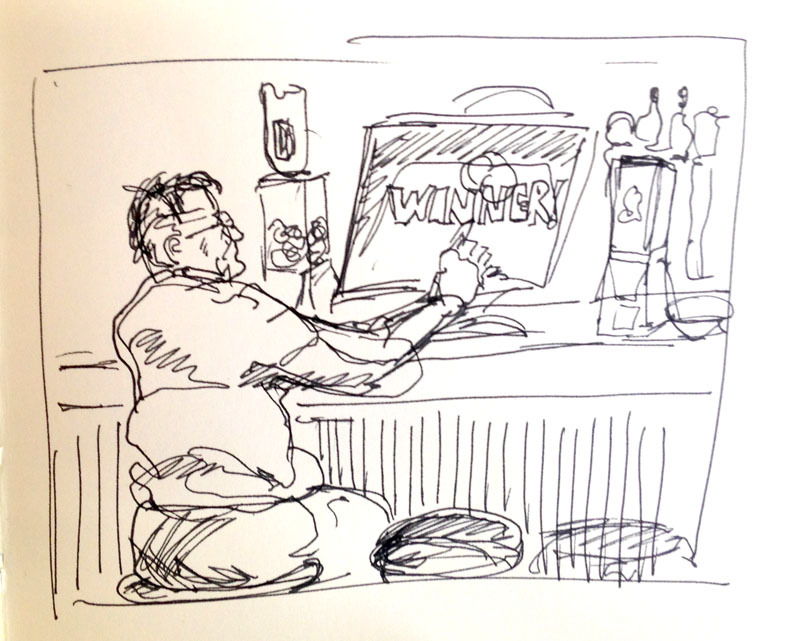 This gentleman’s hand moved so quickly across the gambling touch-screen that it was mostly drawn from a composite memory of hands in my head, but visual memory is generally what you rely on when you draw moving people. We were all very open about our intentions, and we had the safety of numbers, but I did have to fend off a pool player or two (who, by the way, make for great gesture drawings) who were a little too enthusiastic about being drawn by a table of women, perhaps misinterpreting the nature of our interest. 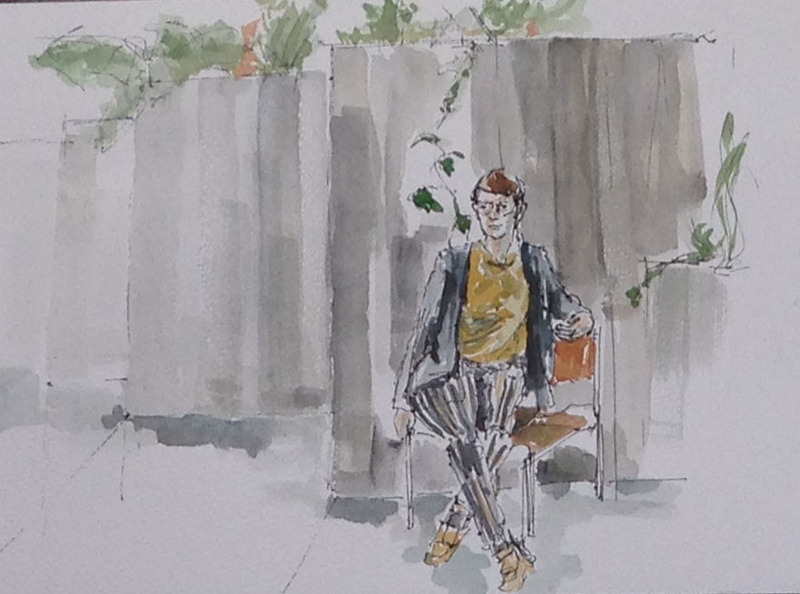 A lovely ink-wash and pen sketch by a student, an experienced drawer and new convert to locational drawing. 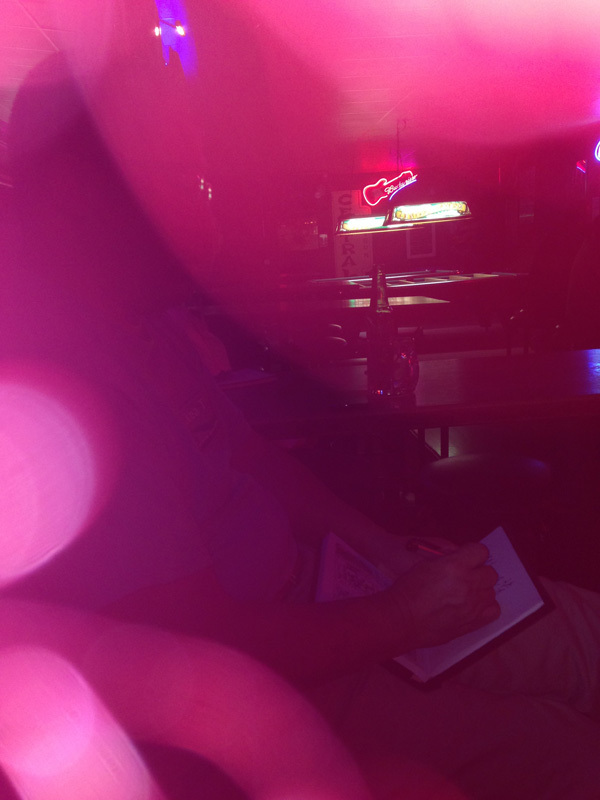 The camera on my phone “thinks” that the neon guitar is the most important thing in the frame, does all kinds of wacky things with the lights, and you can barely make out the hand and sketchbook in the foreground which I was trying to capture. 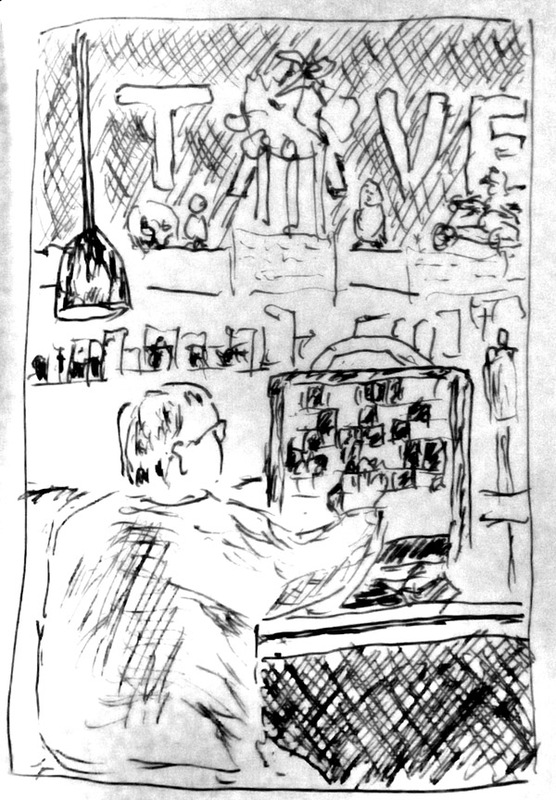 I did manage to get one decent photo after I turned off the flash, but the sketches, even those of beginners, actually documented a lot more information than the camera, as well as being a darn sight more interesting. Let’s go to business school! They do get all the good architecture. 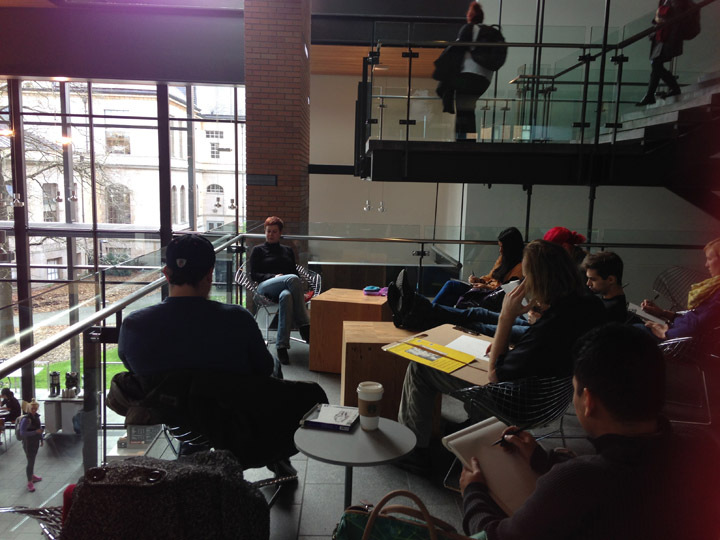 Last Friday my UW Drama drawing class went on a little field trip across the street to Paccar Hall, home of the Foster School of Business. There’s an abundance of glass and steel, and a sweeping overlook of the bustling cafeteria. 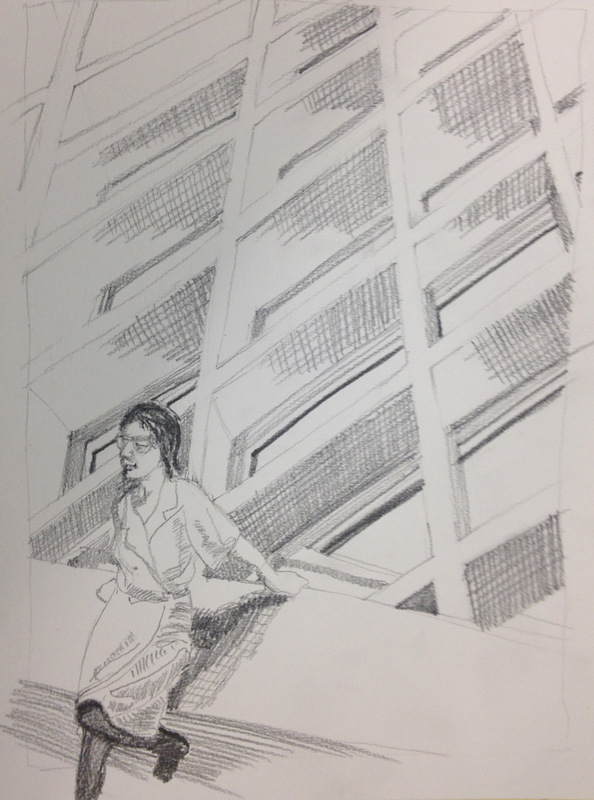 Our model posed on the sleek staircase, and down below in the atrium while we drew her from above, peering over the edge through the glass wall. 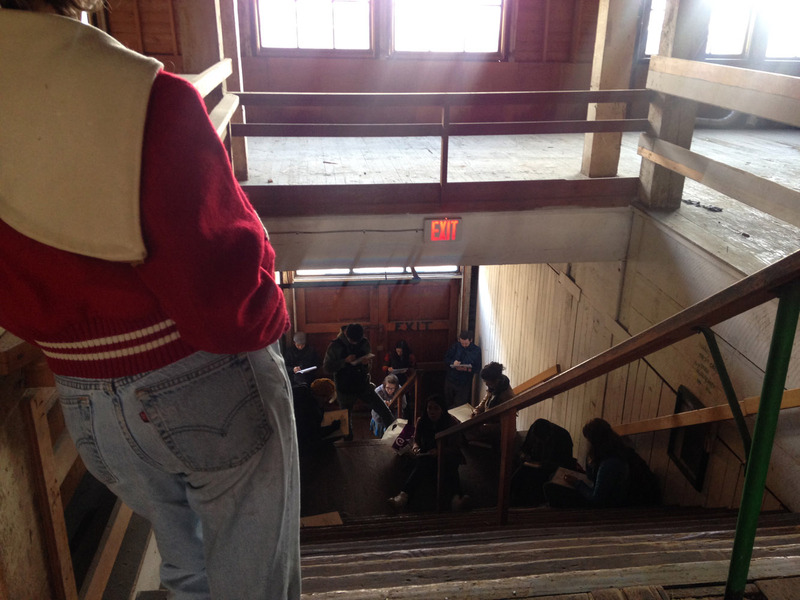 For some of the students, it was the first time drawing a model in such a busy, perspective-heavy environment. 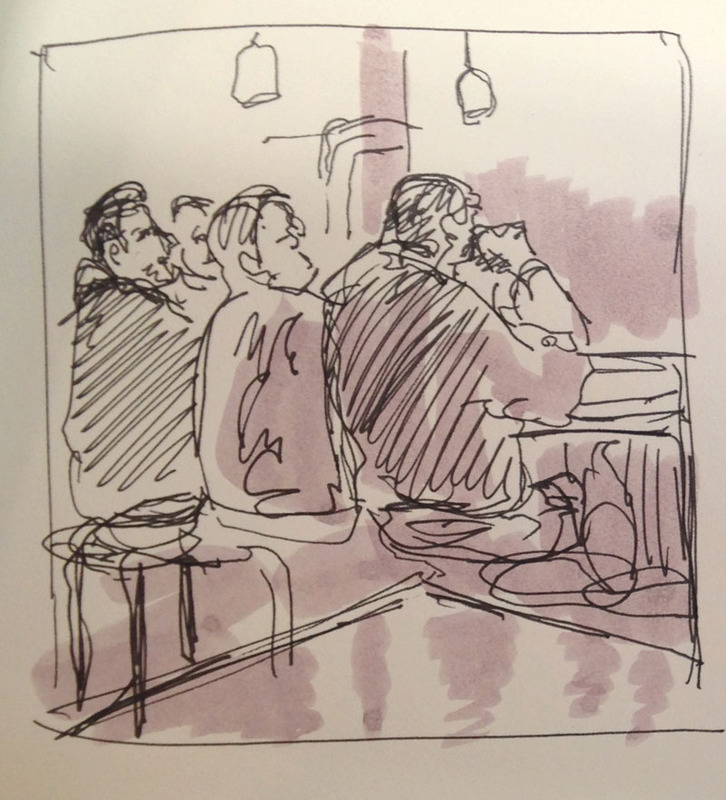 Here’s one successful sketch, done on gray paper in black and white pen by the lady in the purple sweater. 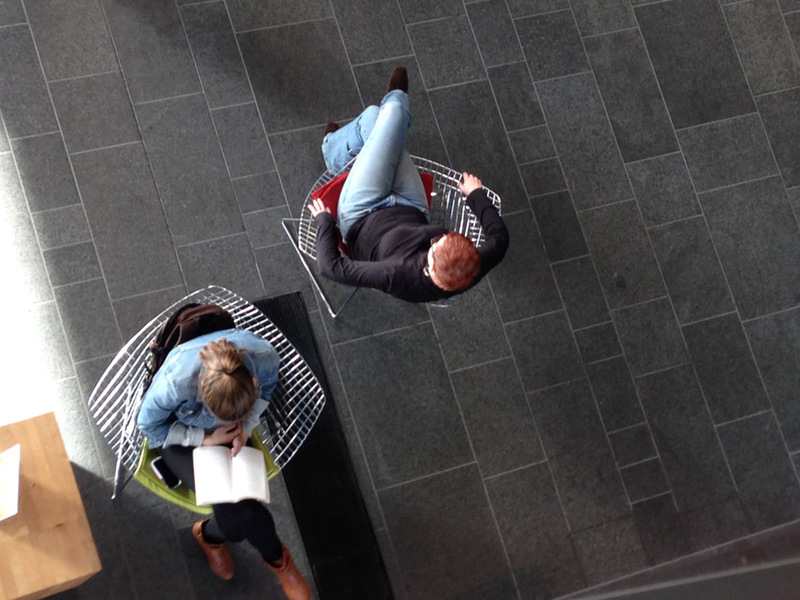 An unsuspecting business student (or some other kind of student who just likes hanging out there) inadvertently modeled for us as well, adding some context and a nice visual counterpoint. 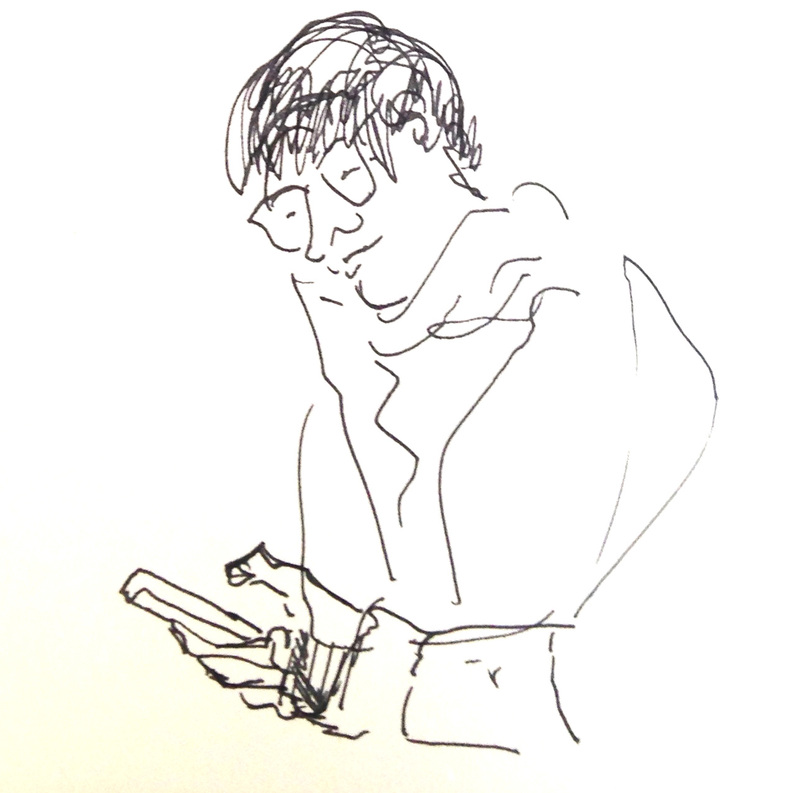 In the film “Drawing on Life“, one of the sketching architects they interviewed estimated that a stranger in a public place will “pose” for you for about three minutes before moving. 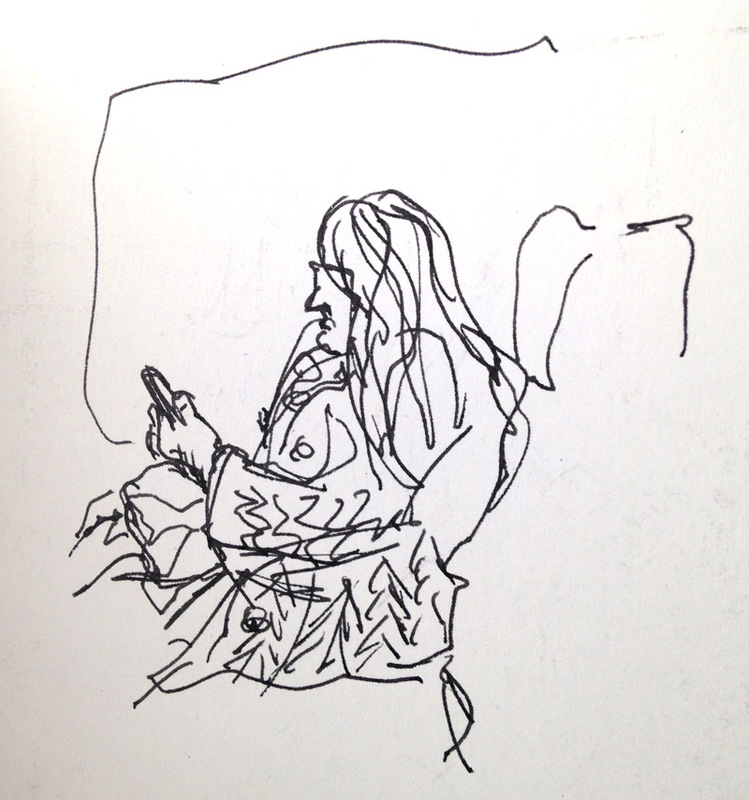 This reading woman posed a little longer. 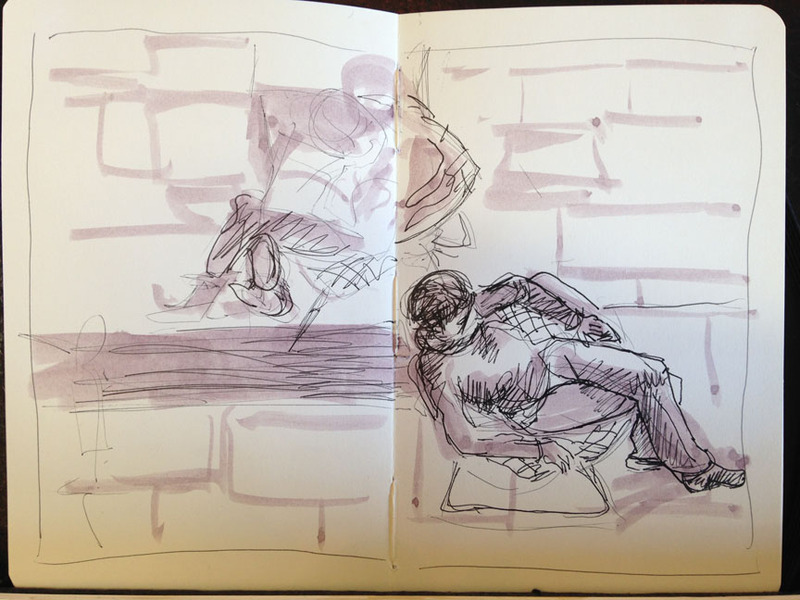 In my experience, if the person is stuck waiting, in an airport, say, they will eventually go back to the same position so you can finish your drawing. This one is unfinished only because I had to go and help other people with their drawings. 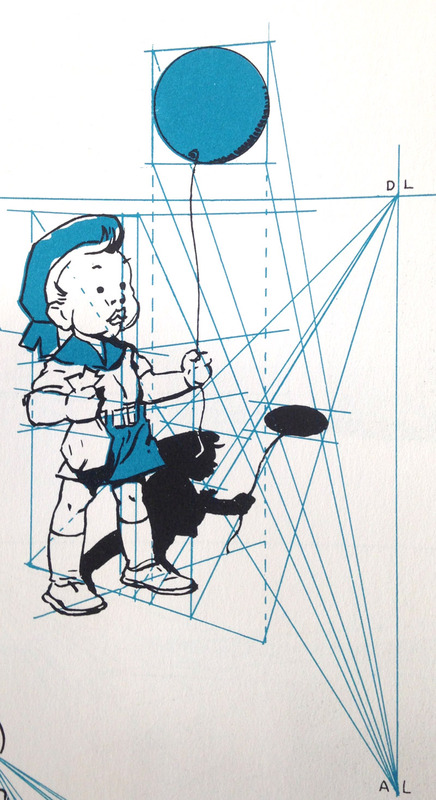 The angles and long depth of field posed challenges, but also provided some guides for placing the figure, and for measuring and proportion. 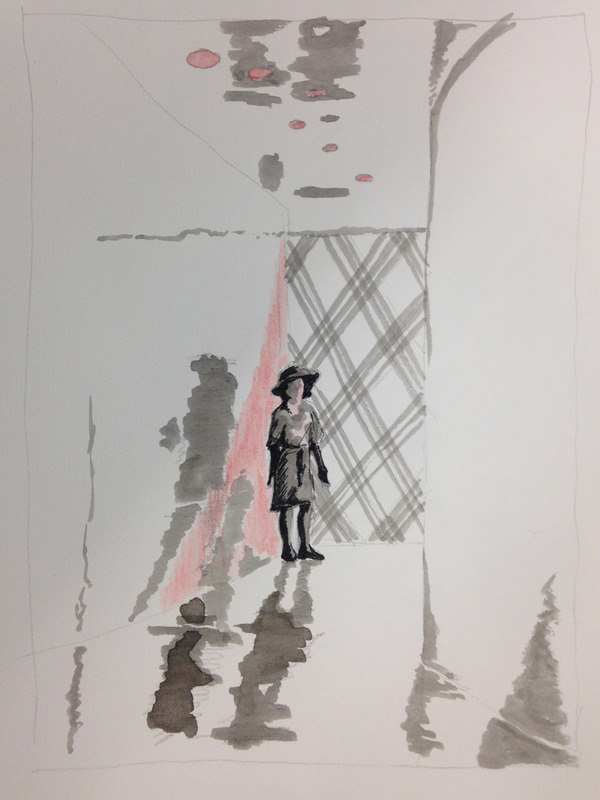 Someone asked me where to start, the figure or the ground. The real answer is “both,” but that wouldn’t have been very helpful. 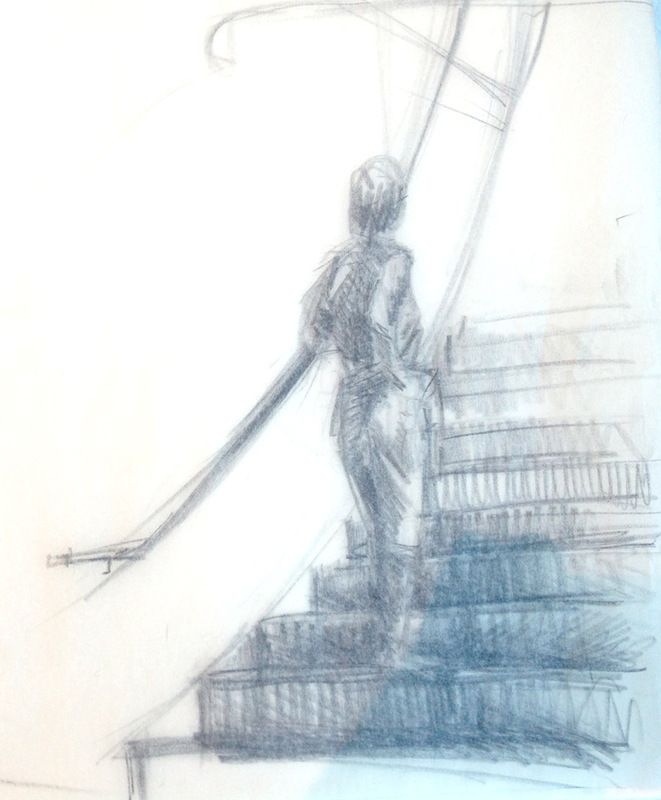 As a practical solution, I told him to start with an obvious straight line that intersected the figure, horizontal or vertical first, then move on to the oblique lines that you have to visually measure. 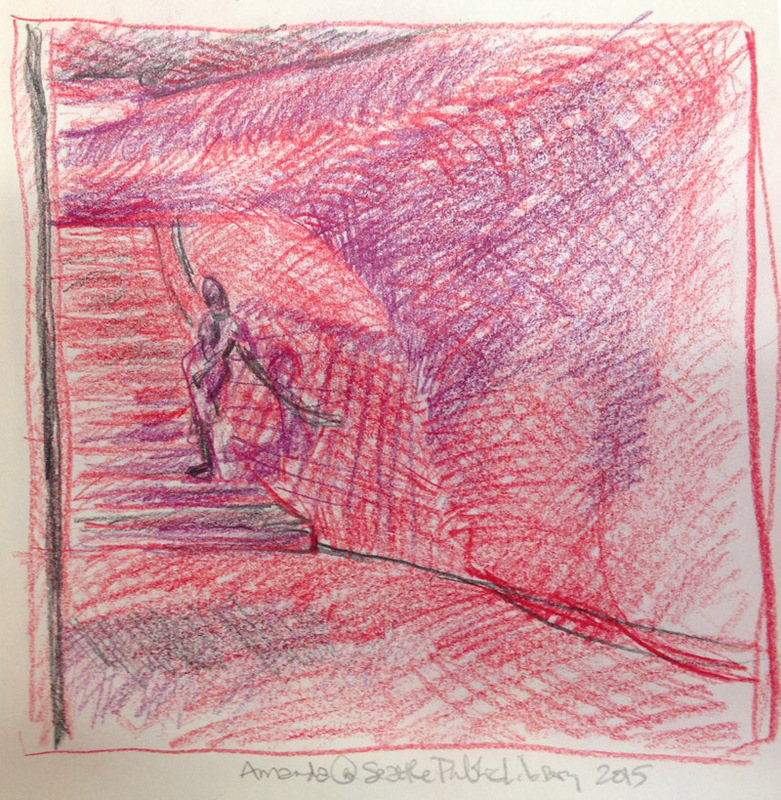 Shifting your focus back and forth between figure and ground does not come naturally. 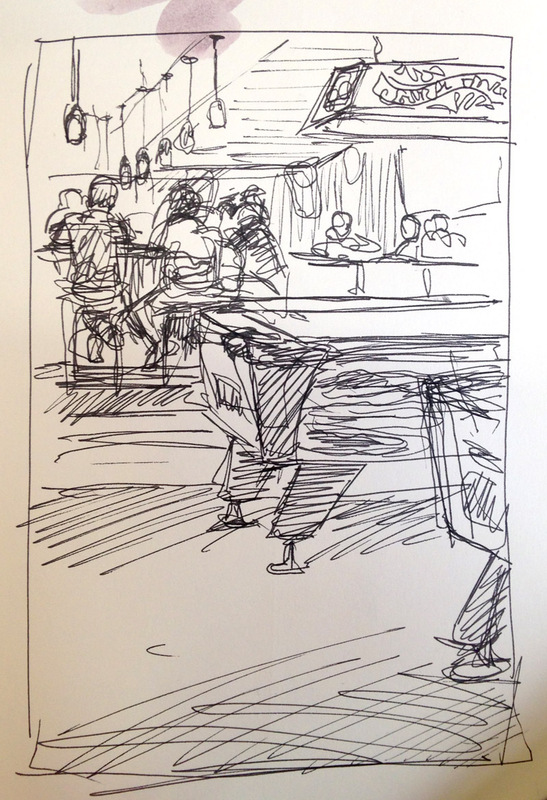 We’re hard-wired to focus on a single item in our overcrowded visual environments. Those of us who stopped to gaze at the intricate patterns made by the grasses of the savannah were eaten by lions before they could reproduce. Which means we are basically descended from philistines, which should surprise no one. 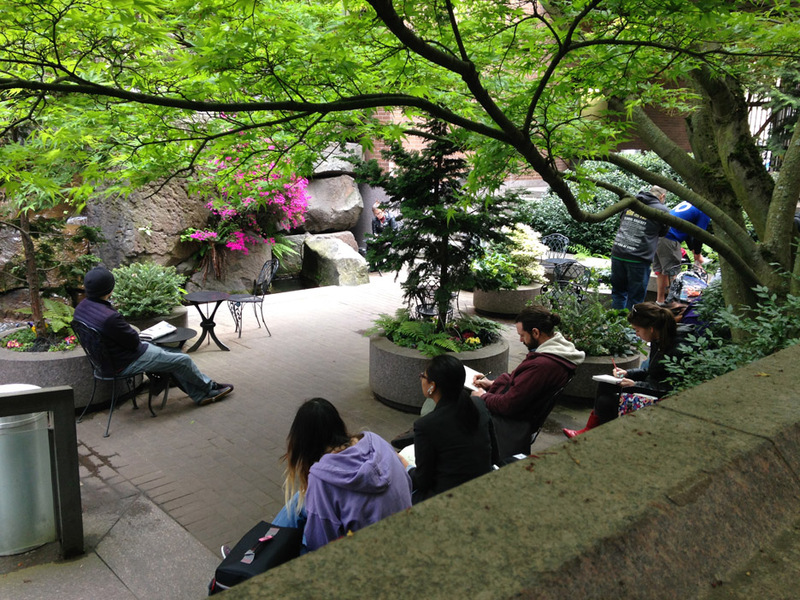 These students, focusing diligently on the shapes and shadows before them, are in very little danger of being eaten by wild animals, but I suppose someone could steal that coffee that’s just sitting there.